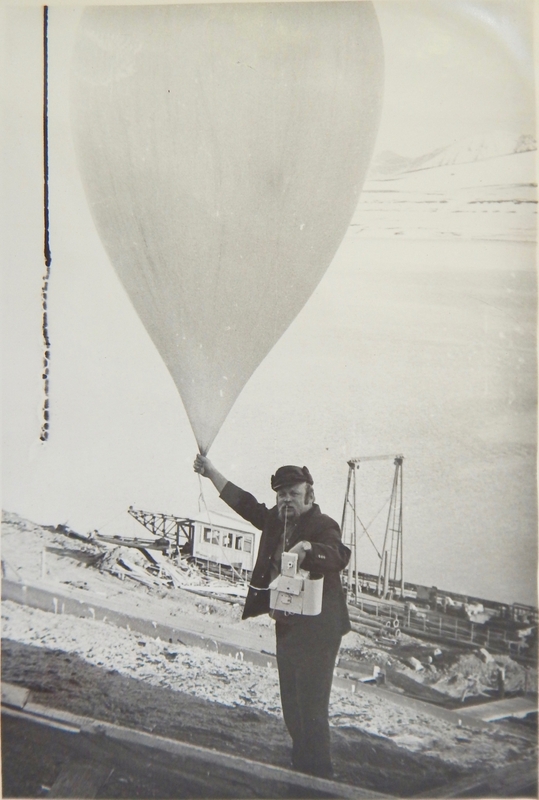 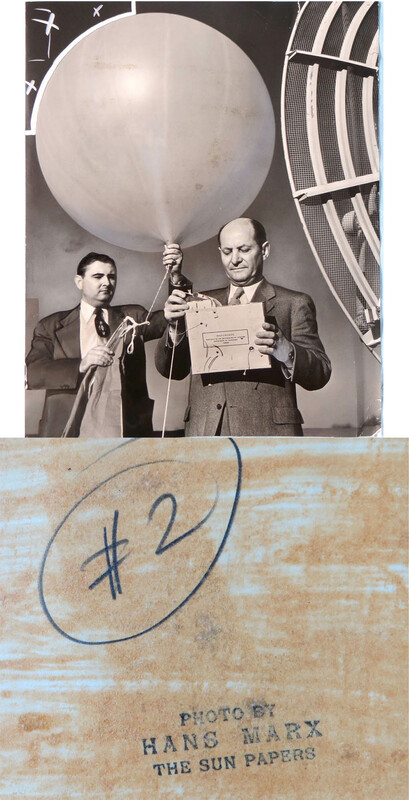 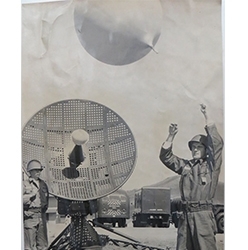 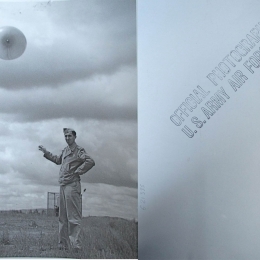 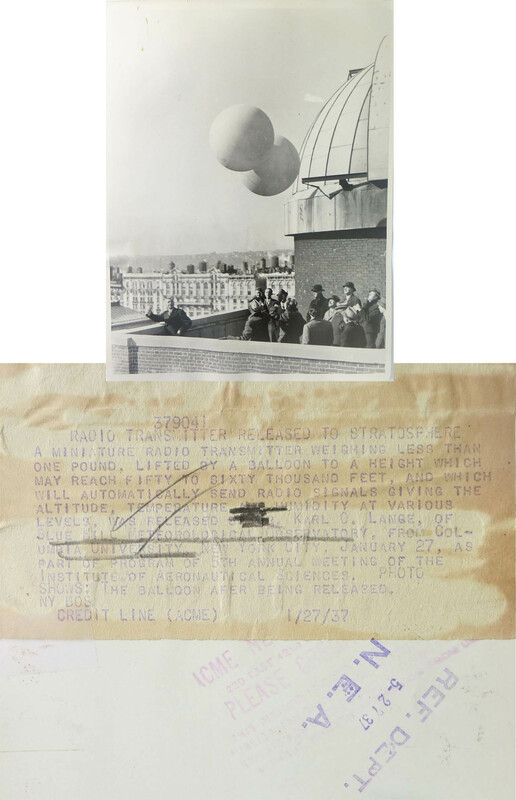 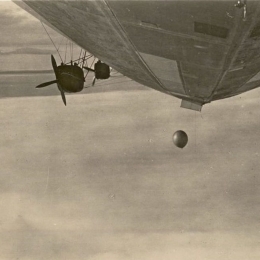 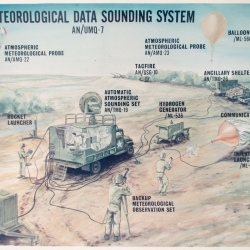 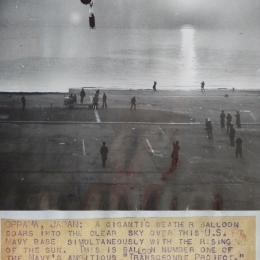 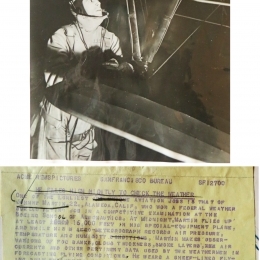 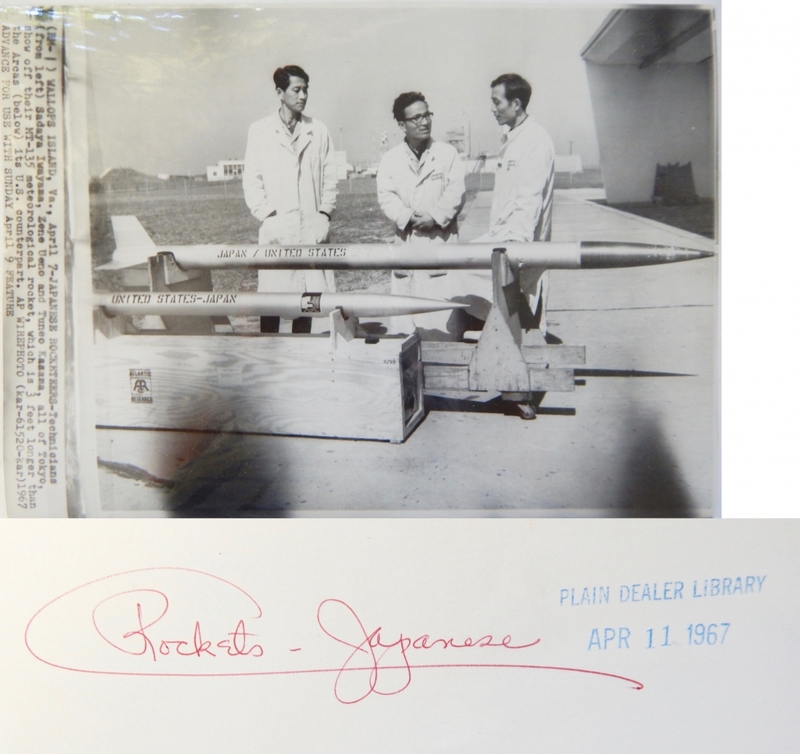 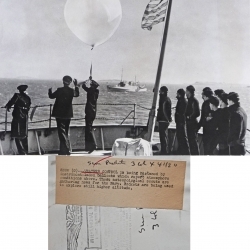 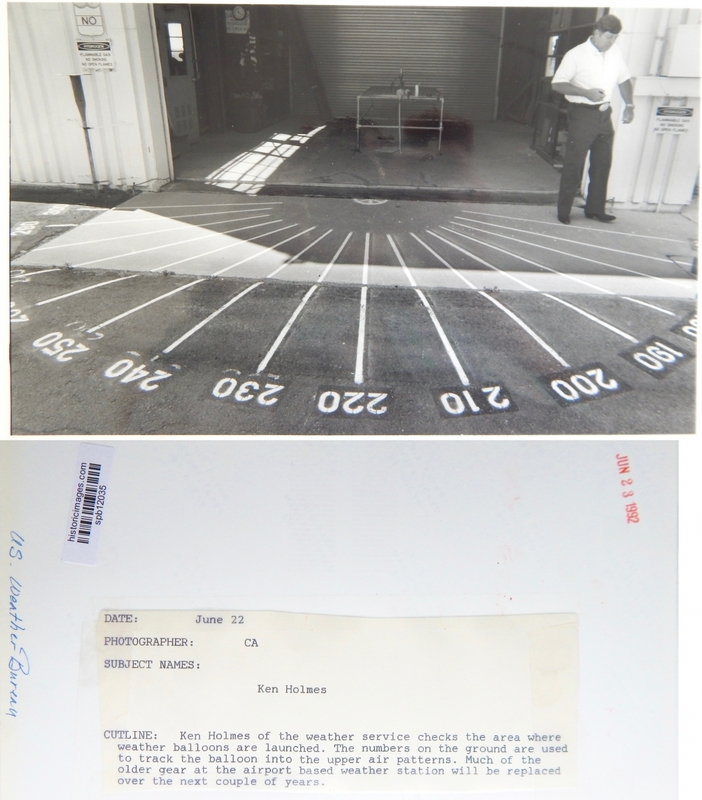 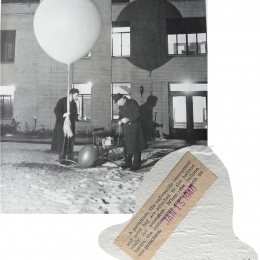 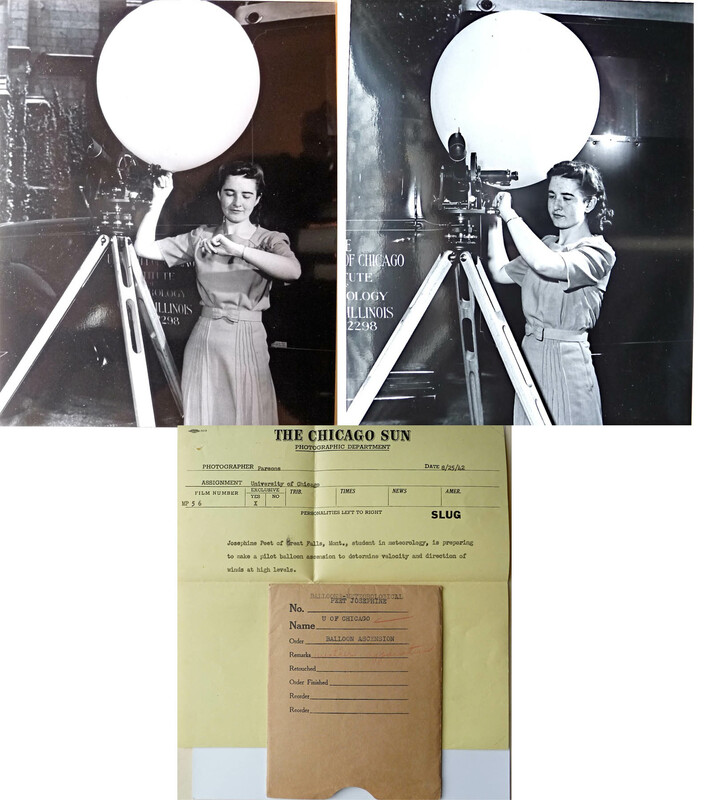 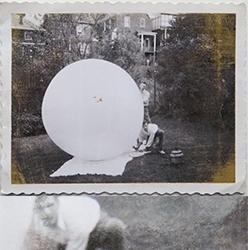 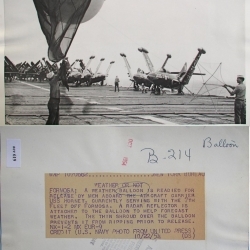 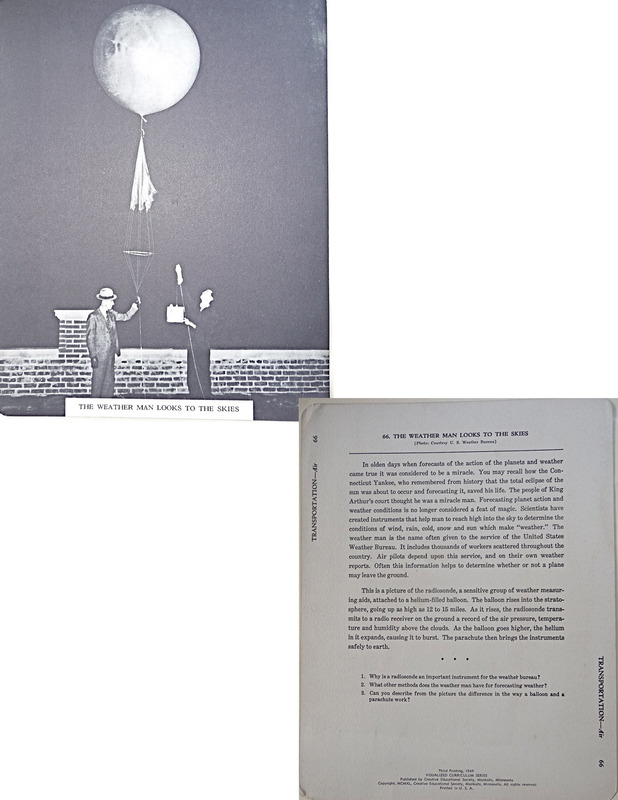 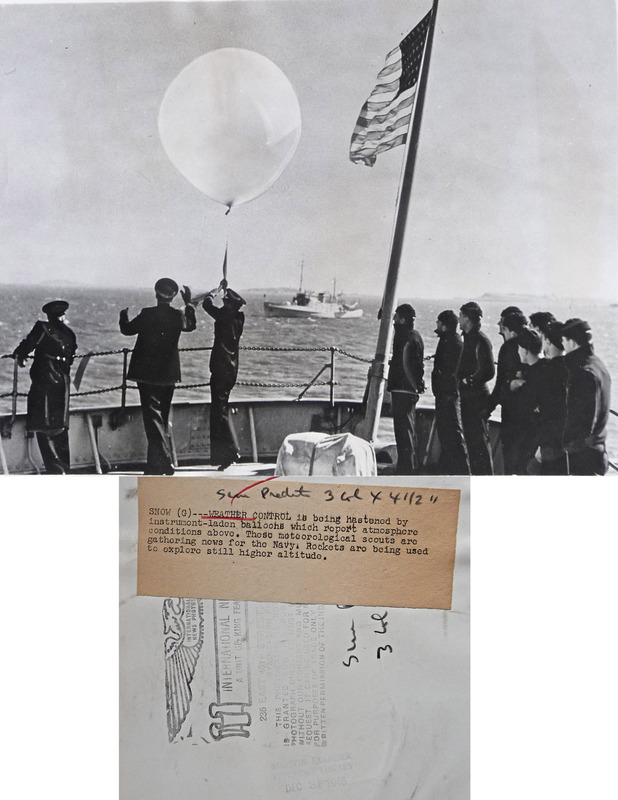 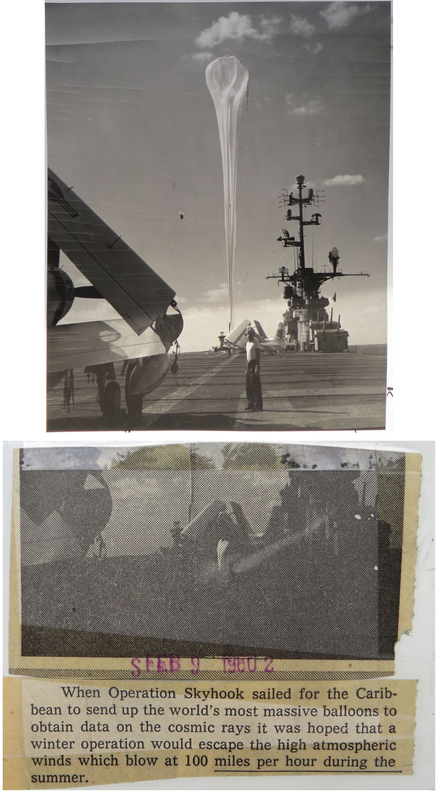 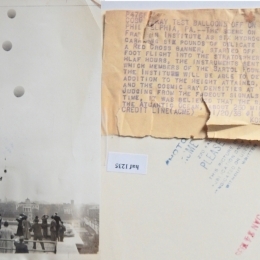 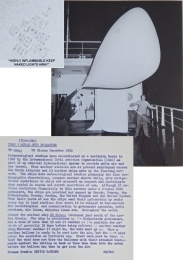 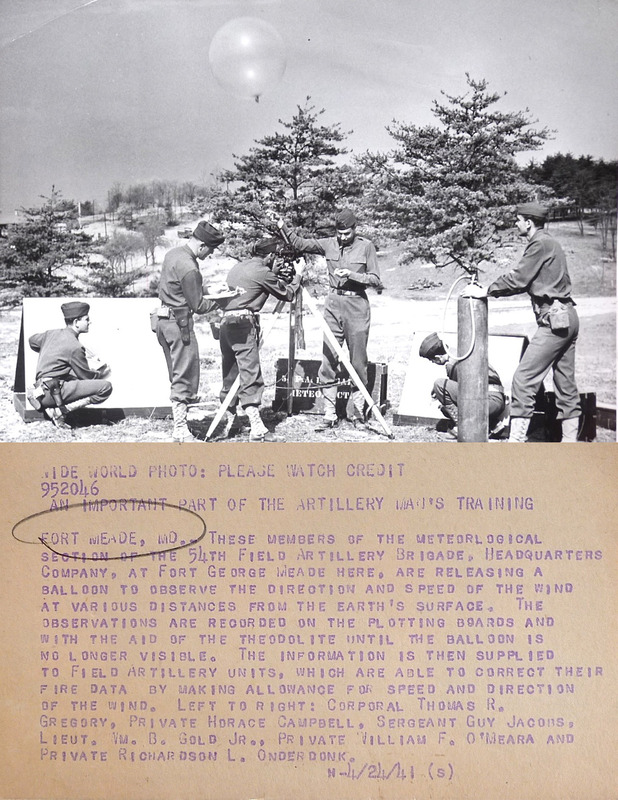 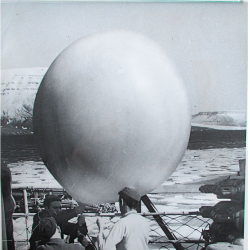 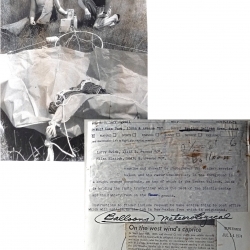 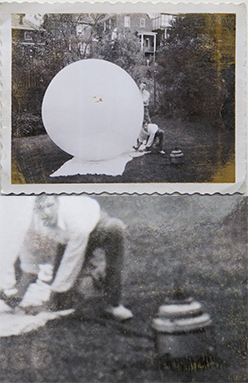 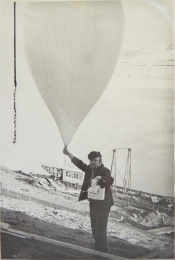 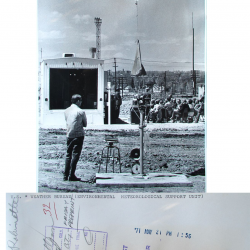 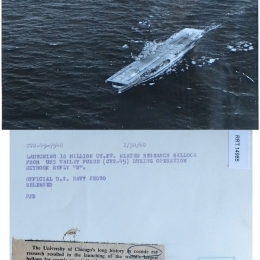 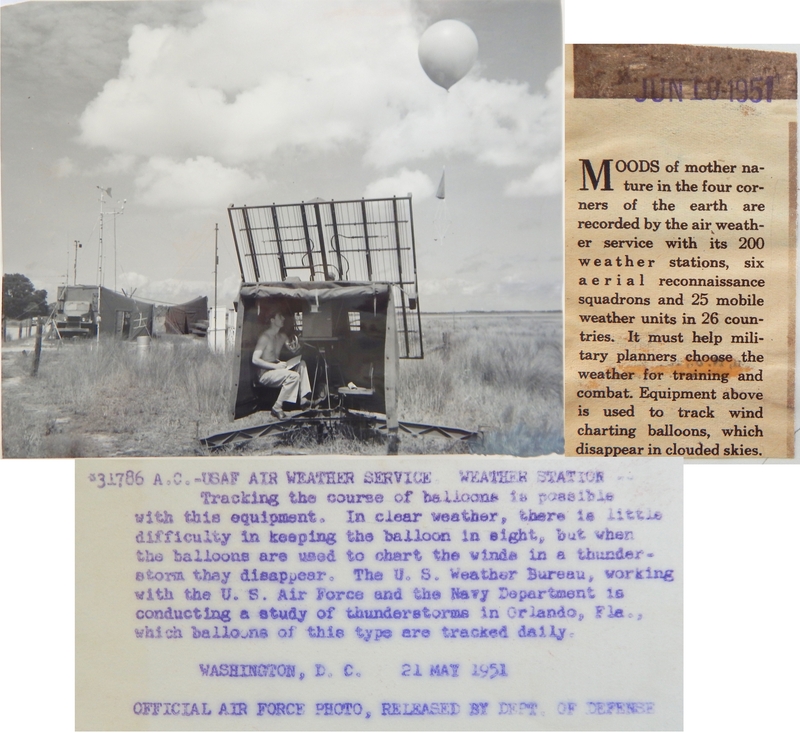 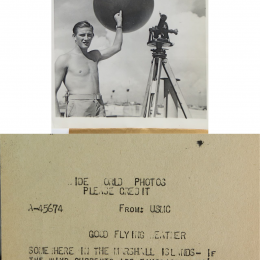 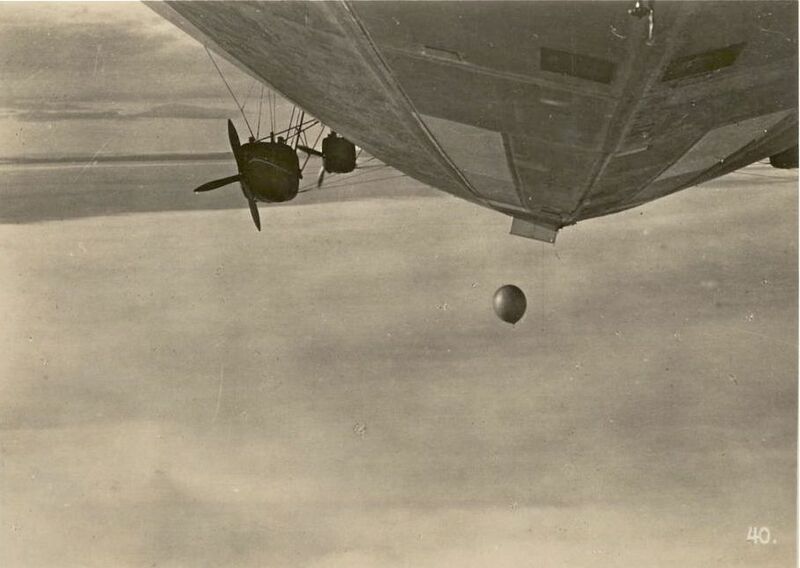 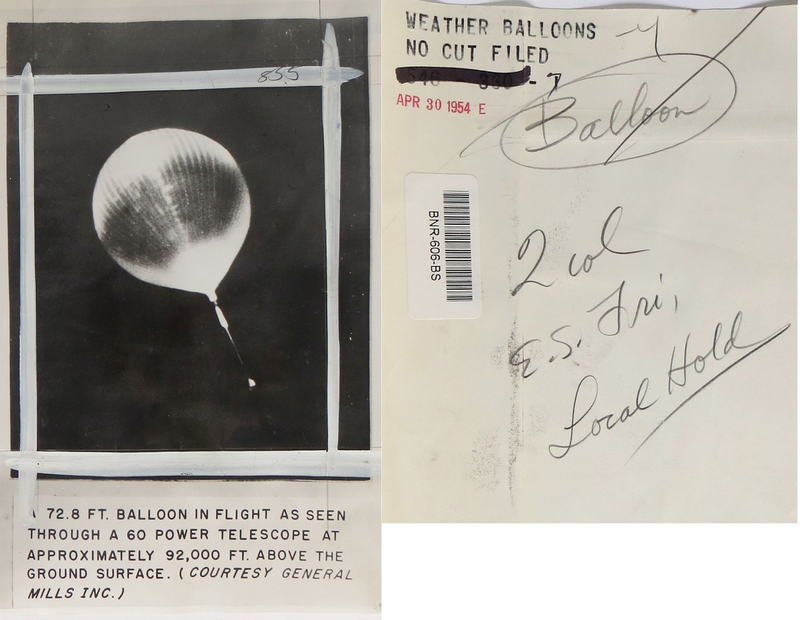 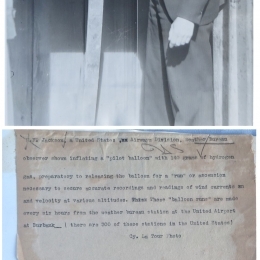 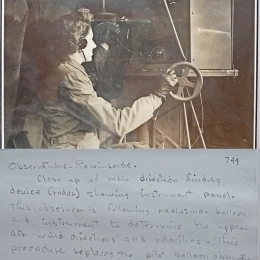 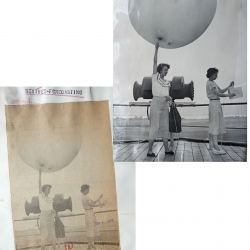 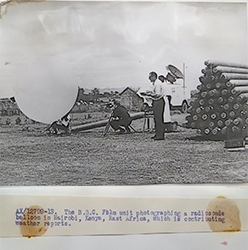 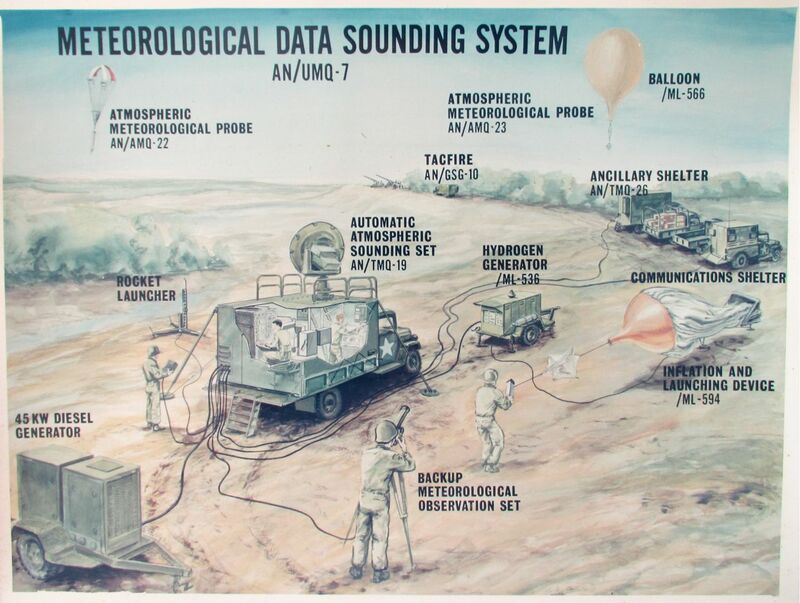 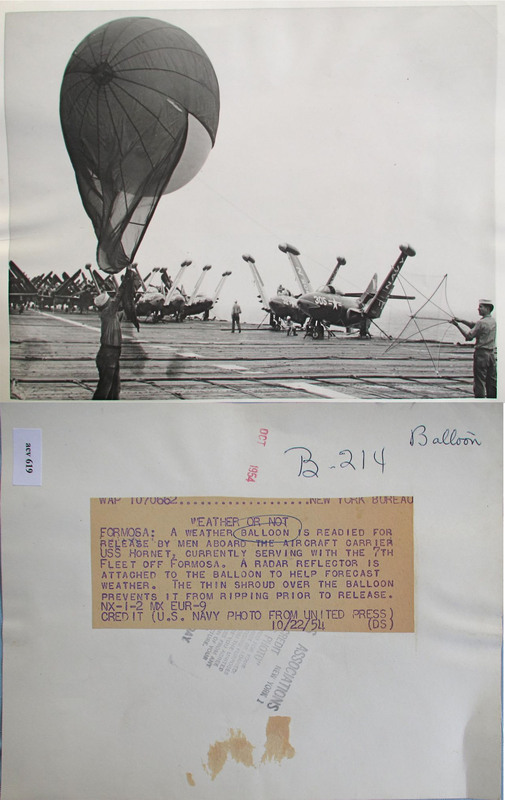 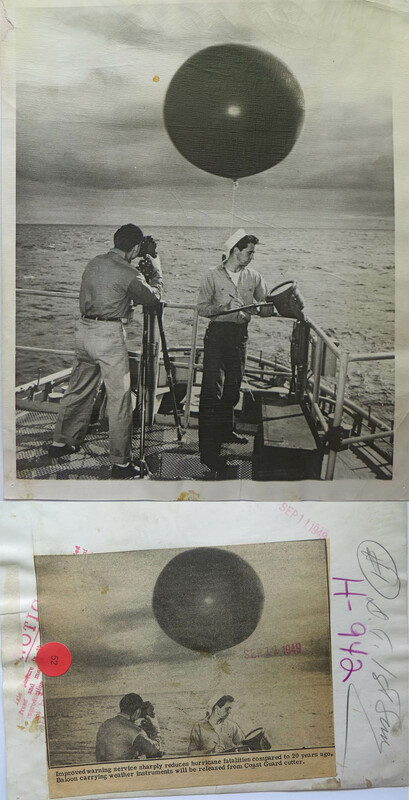 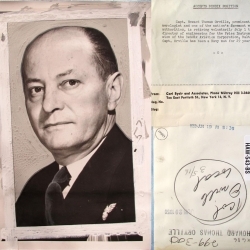 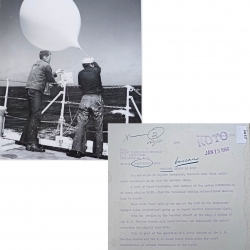 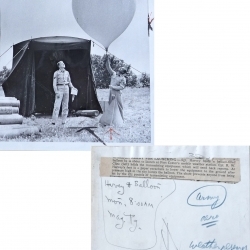 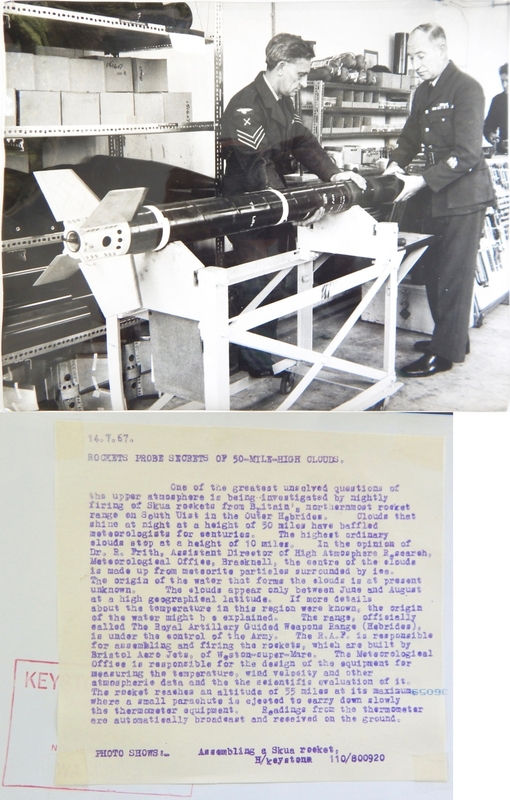 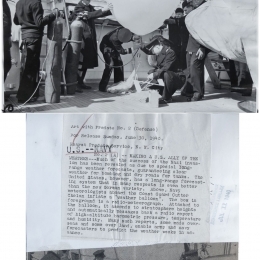 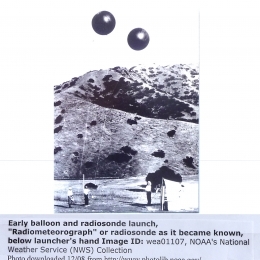 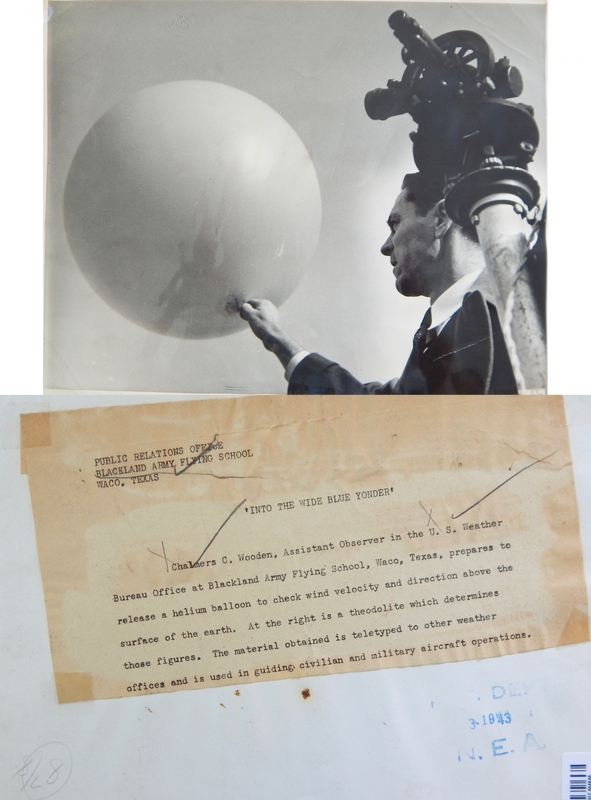 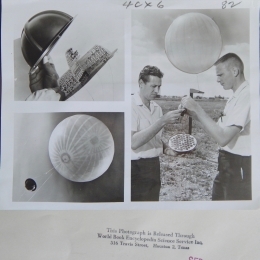 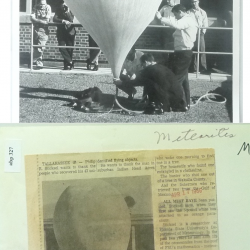 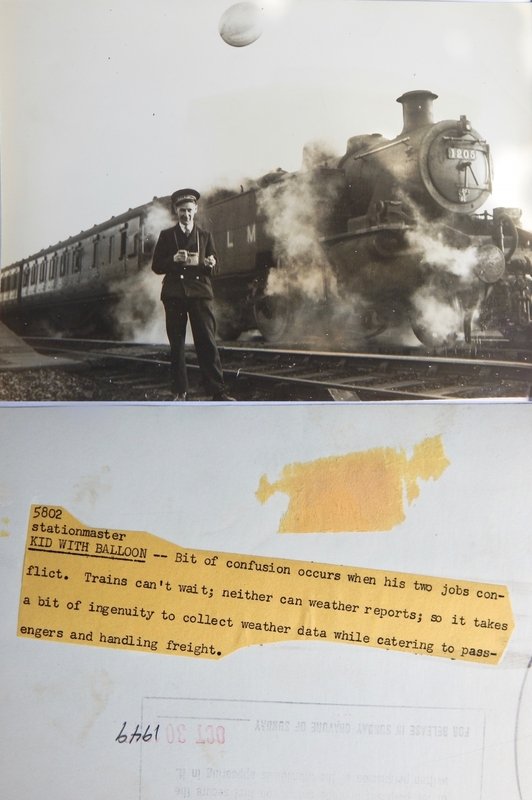 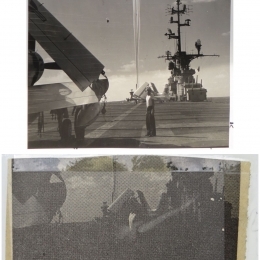 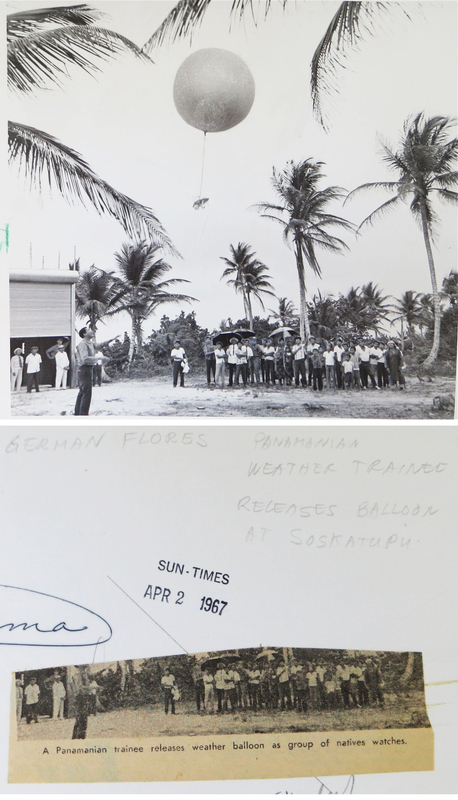 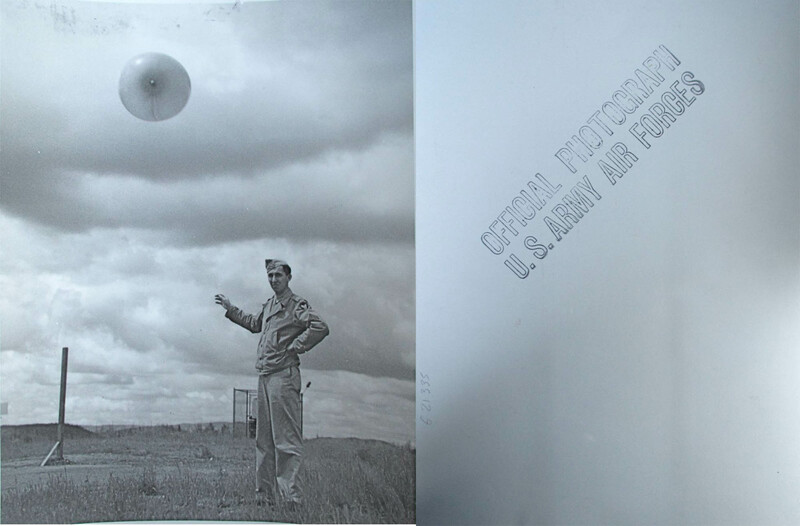 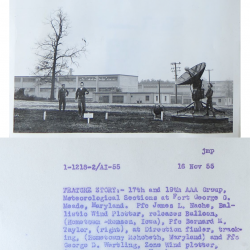 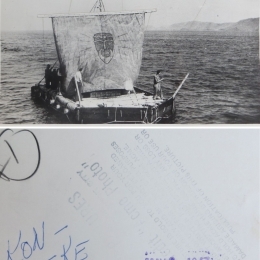 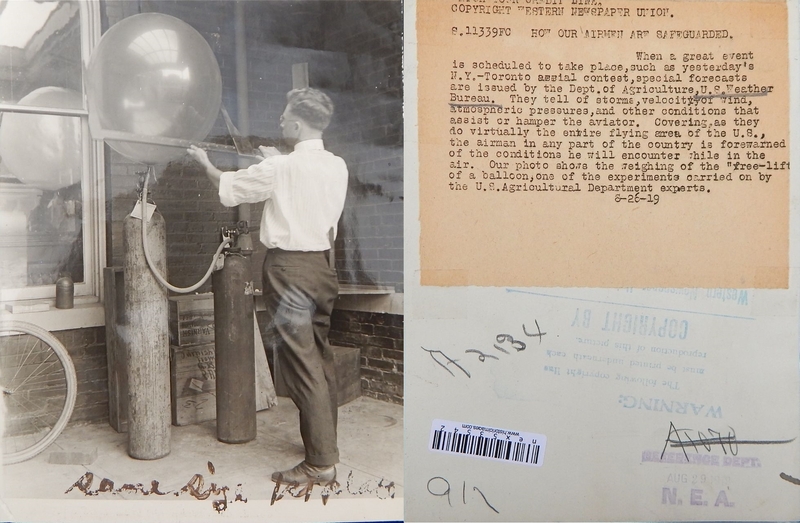 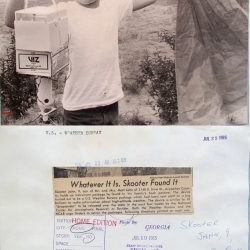 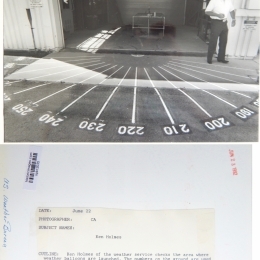 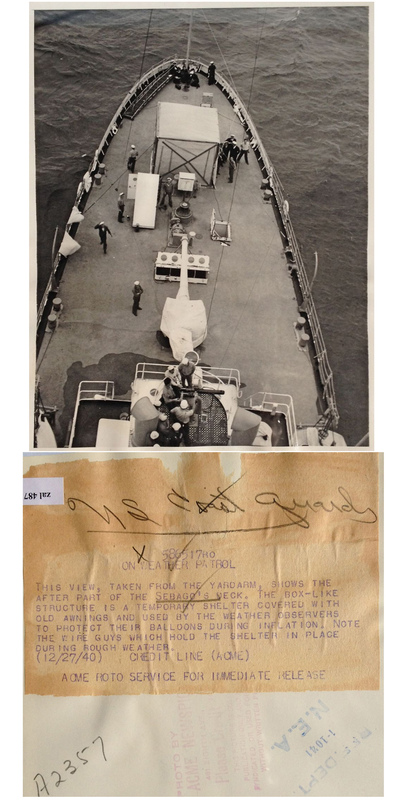 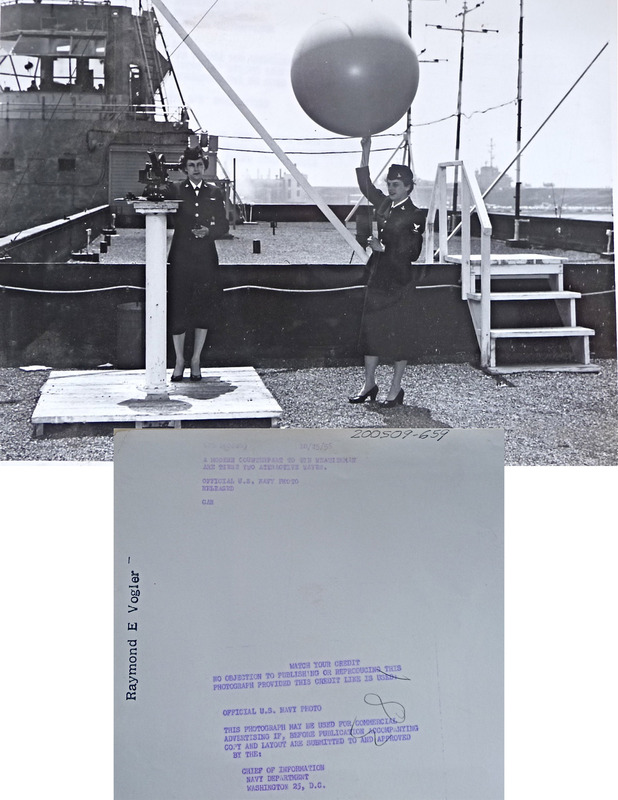 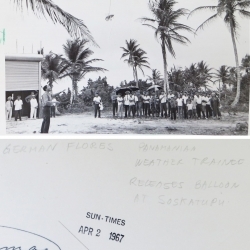 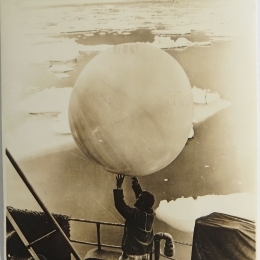 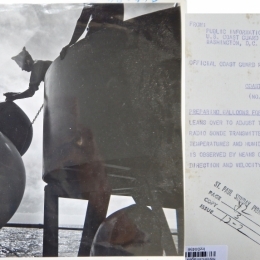 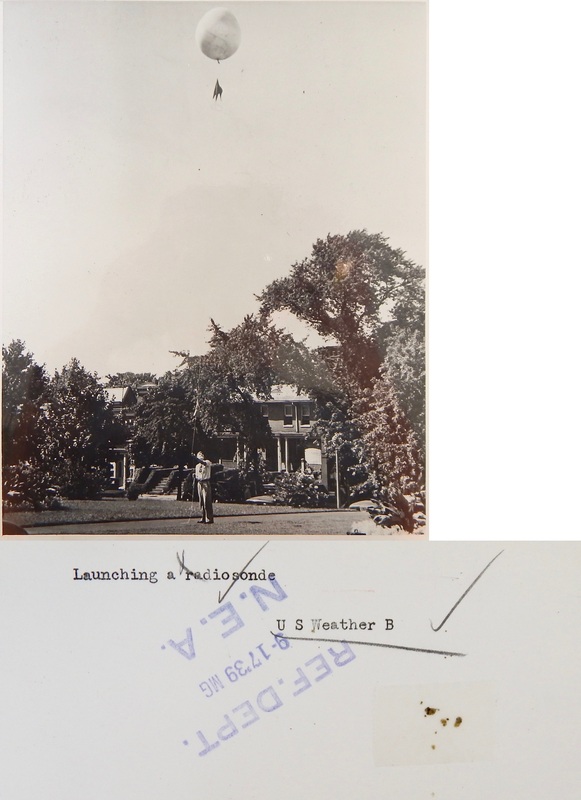 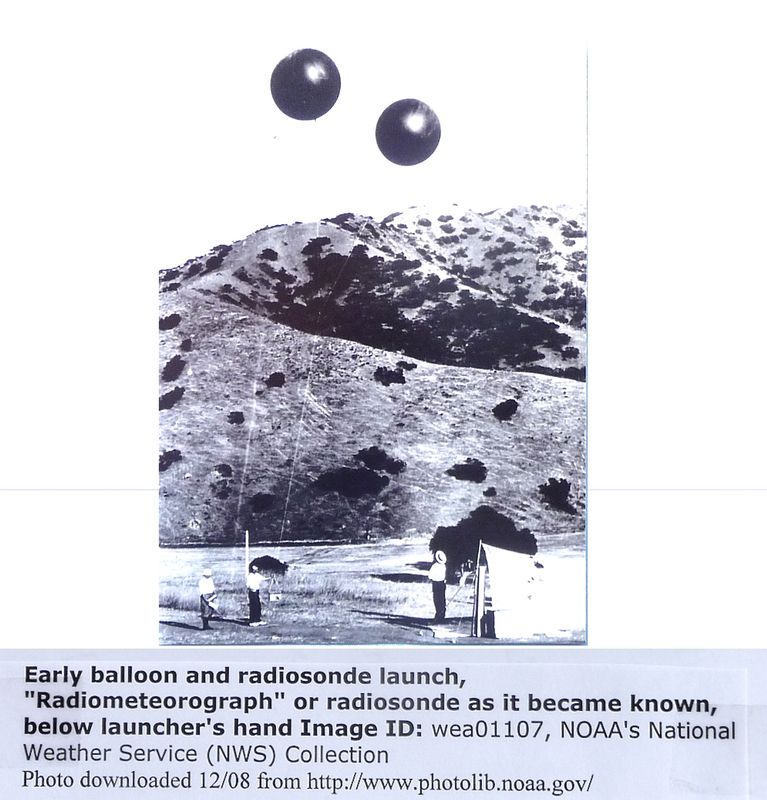 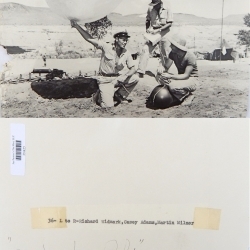 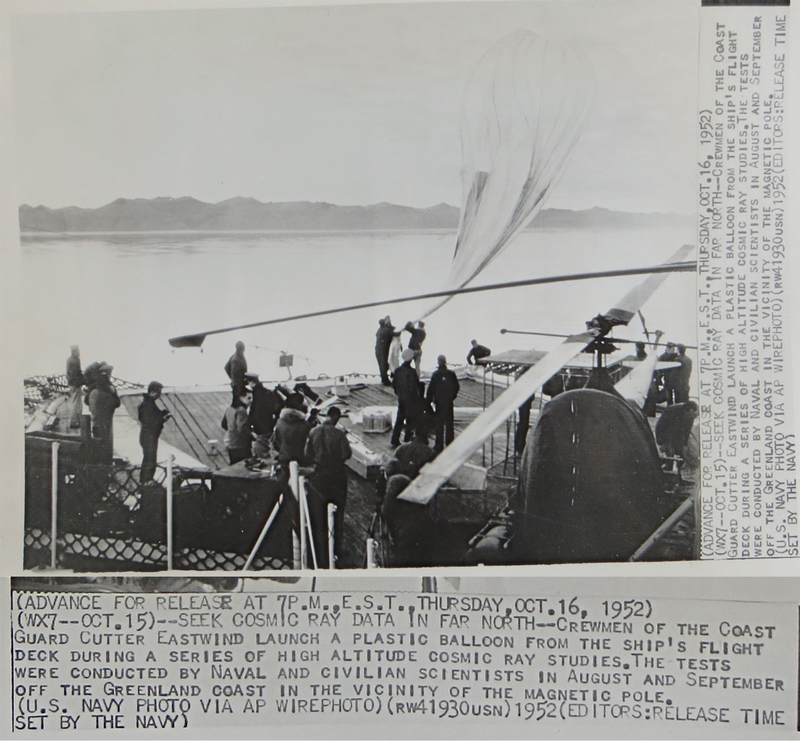 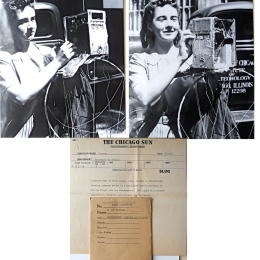 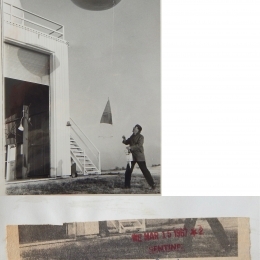 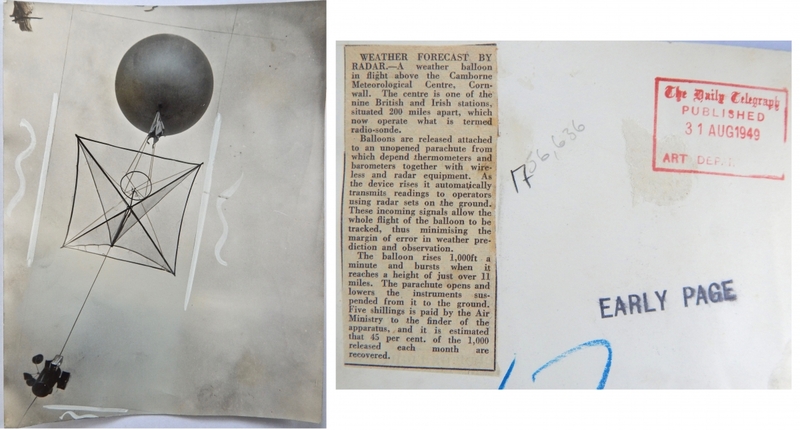 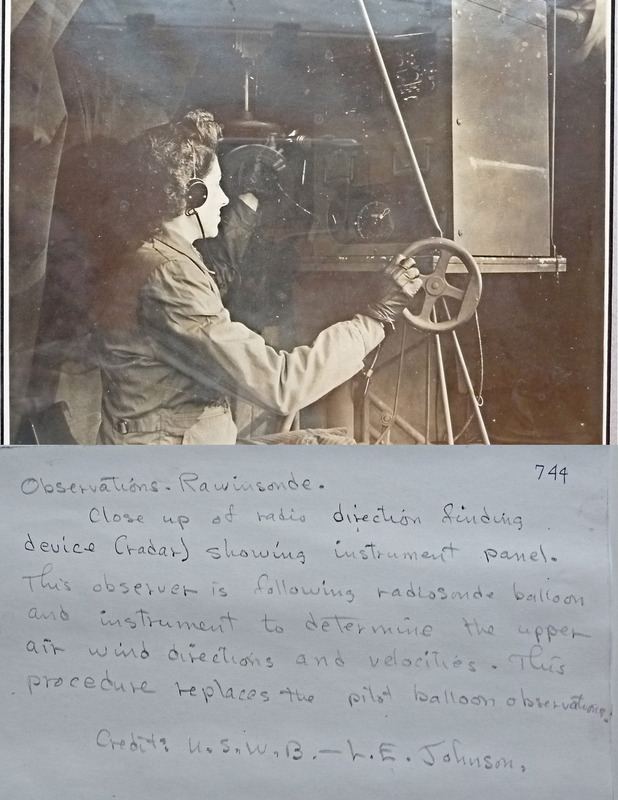 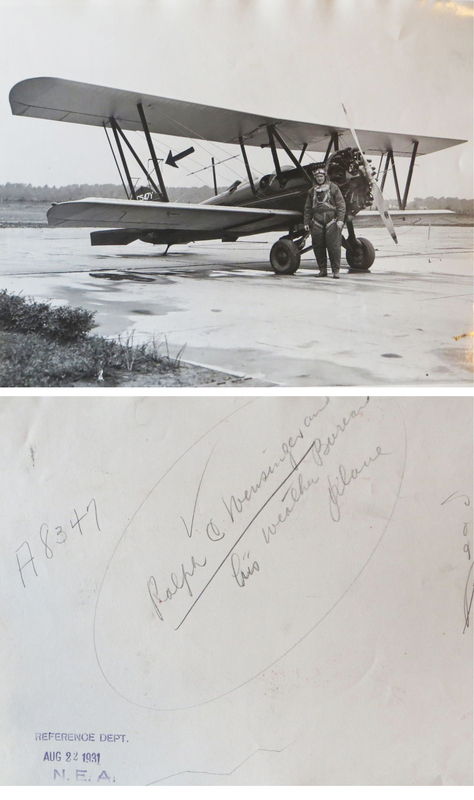 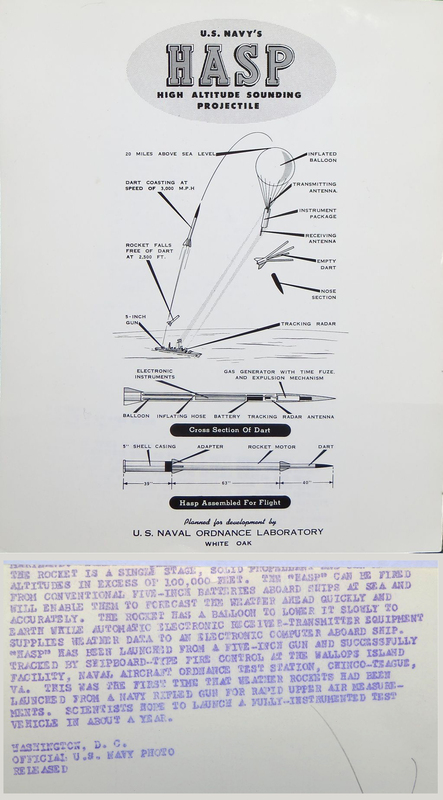 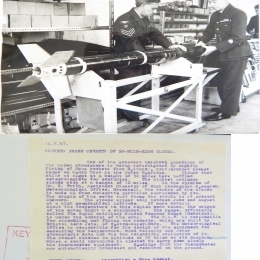 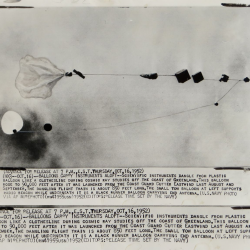 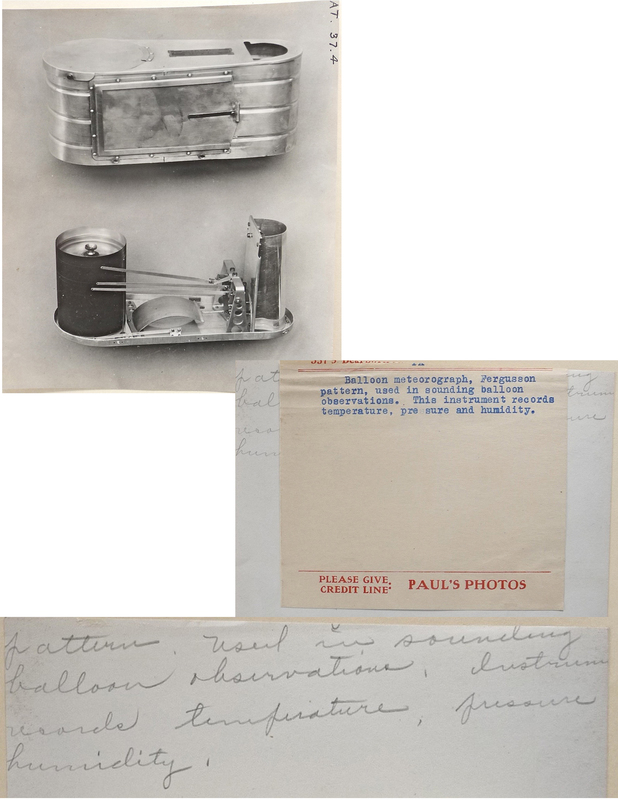 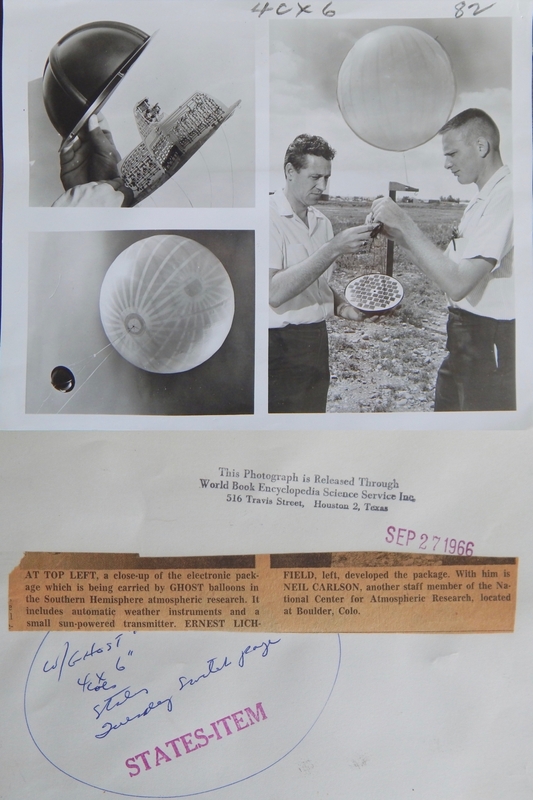 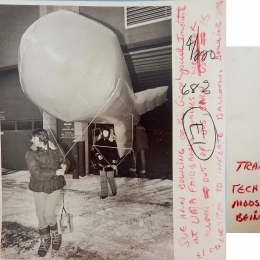 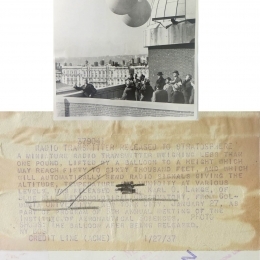 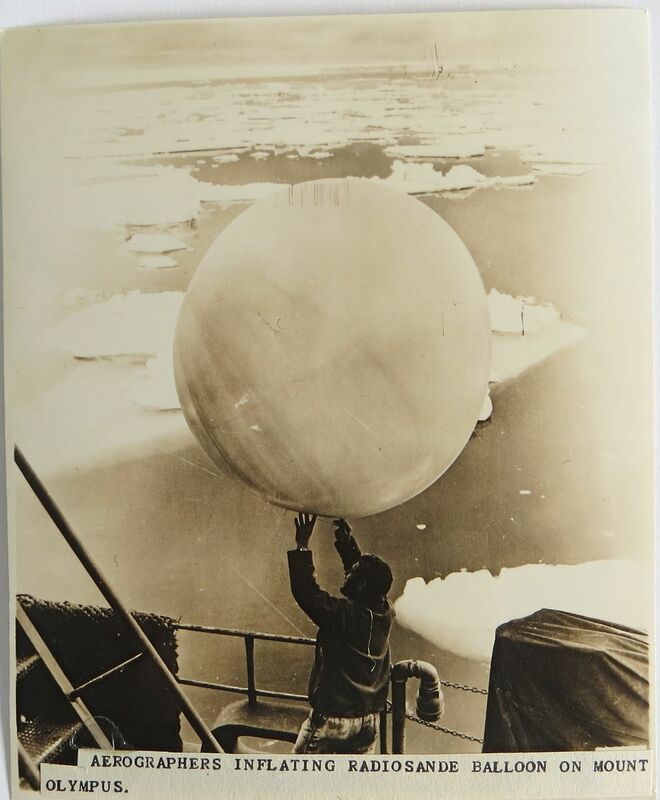 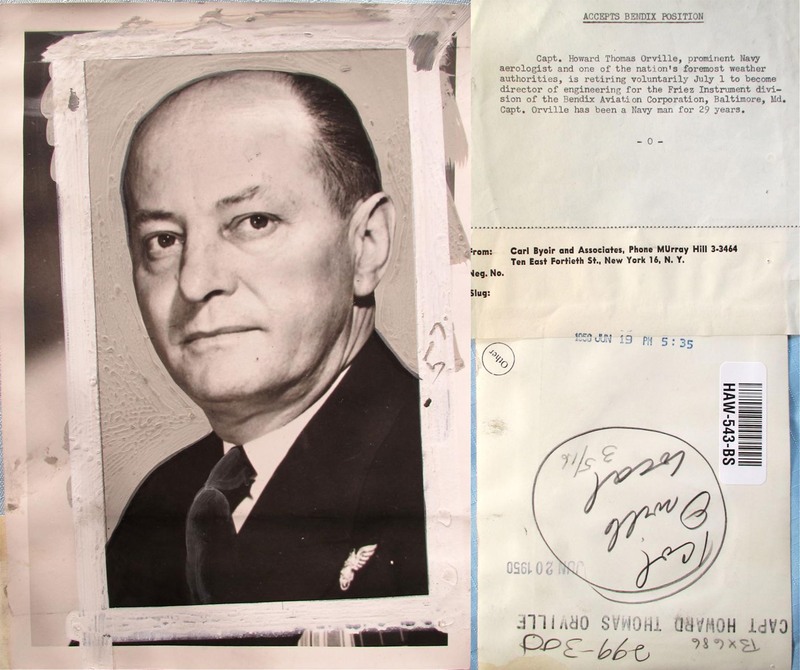 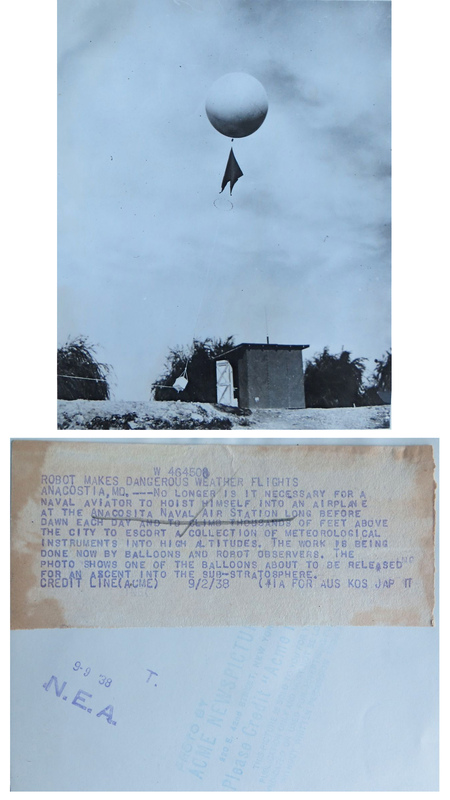 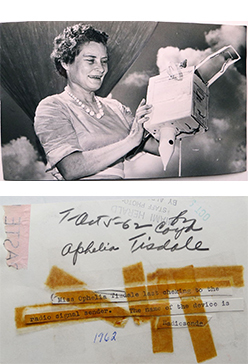 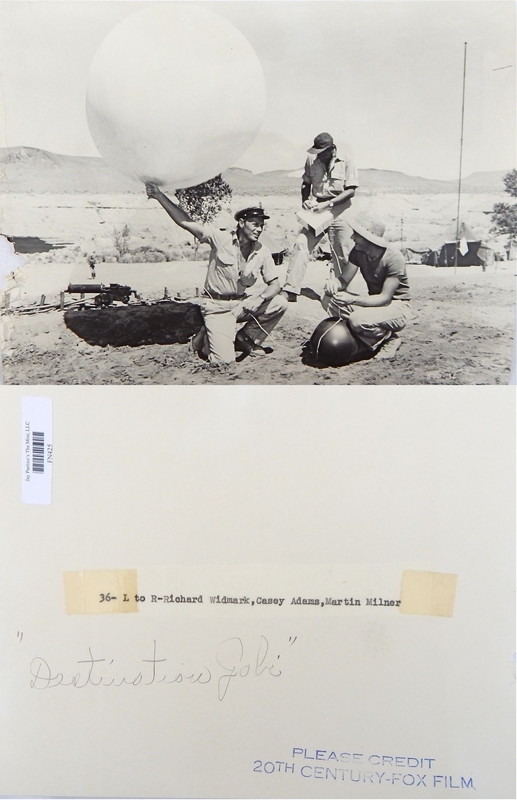 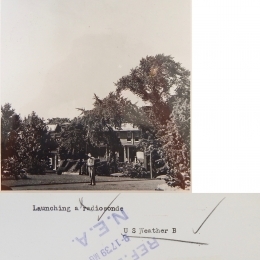 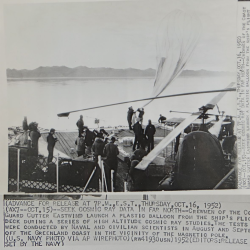 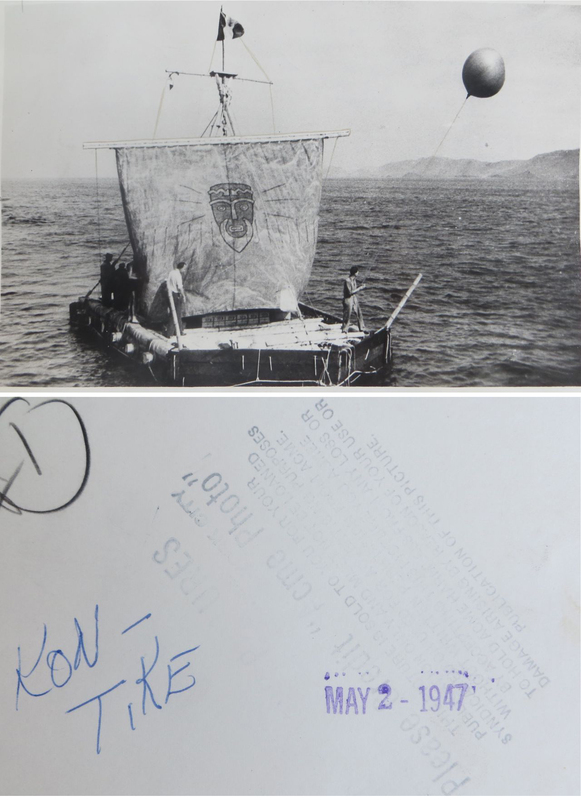 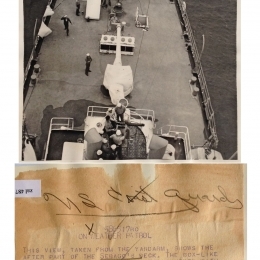 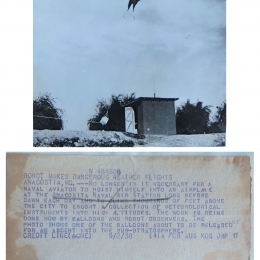 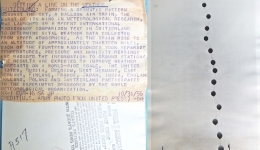 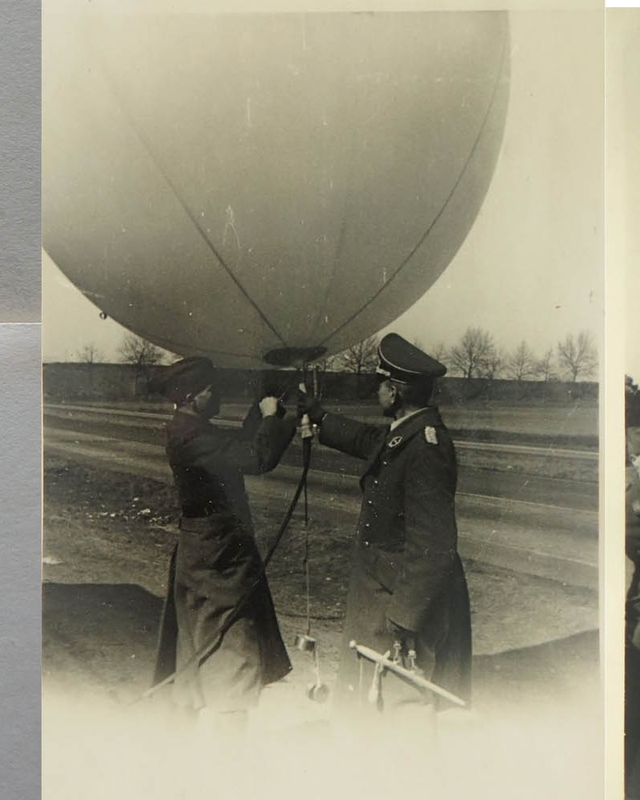 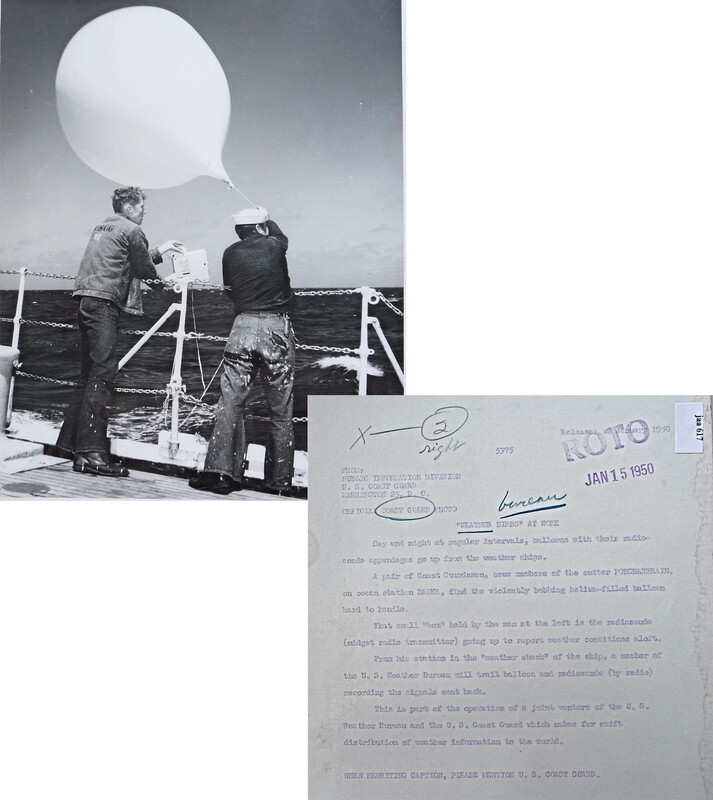 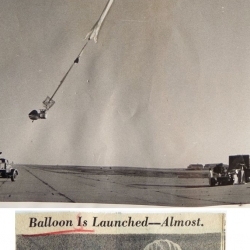 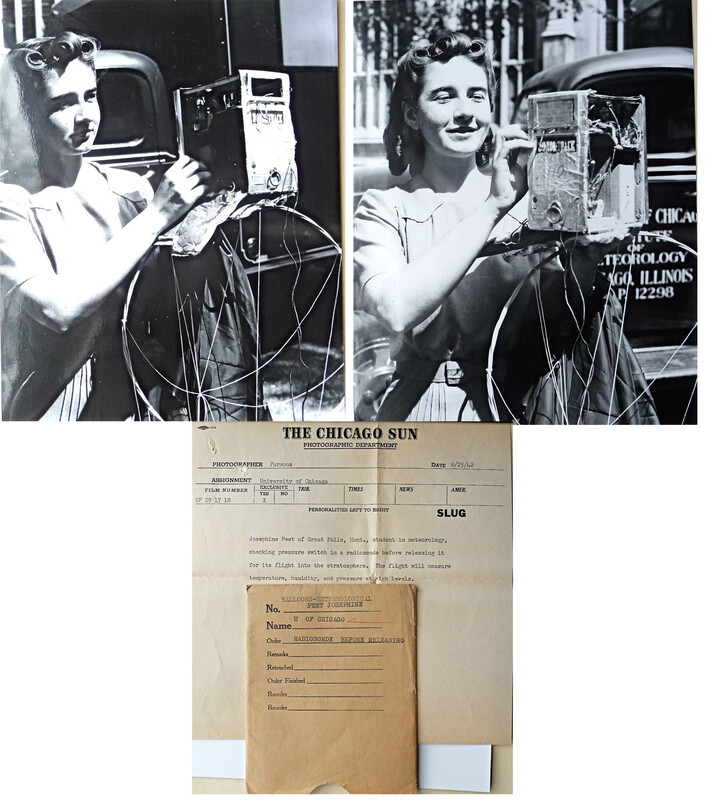 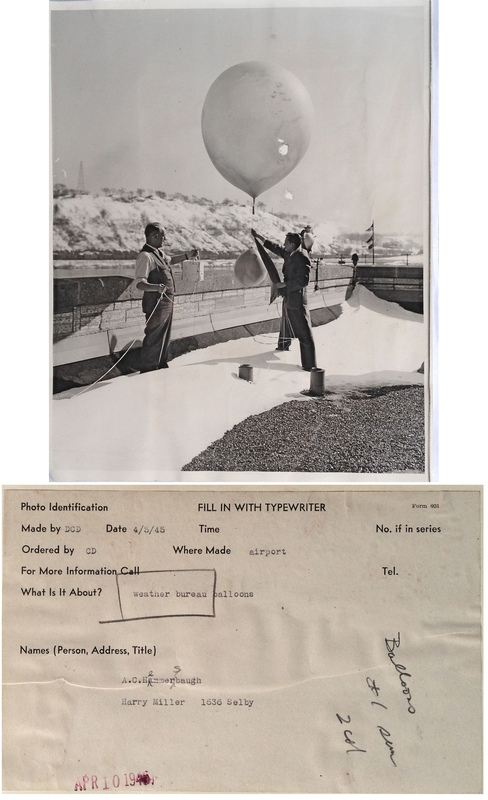 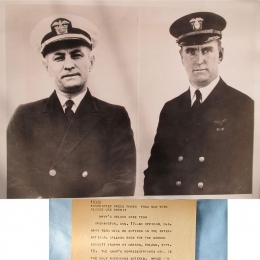 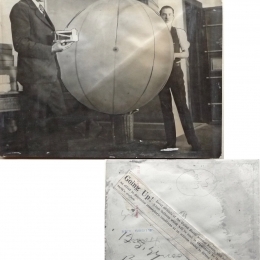 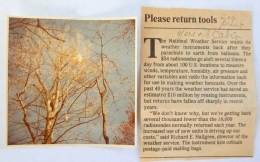 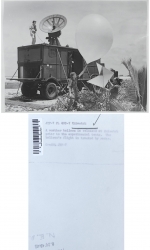 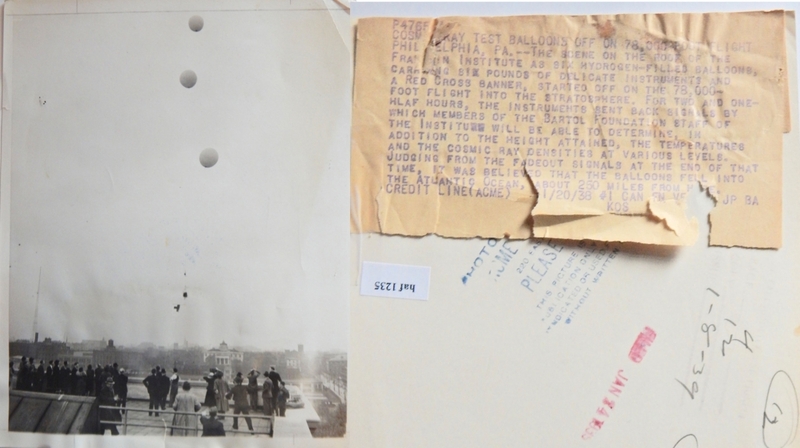 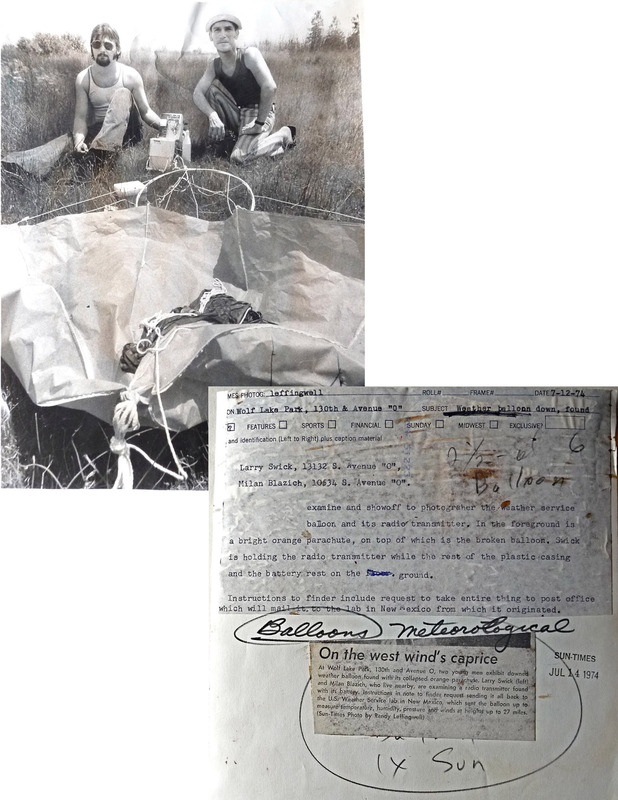 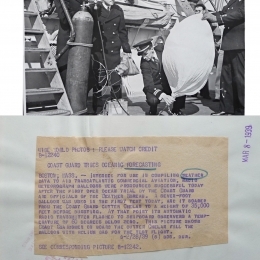 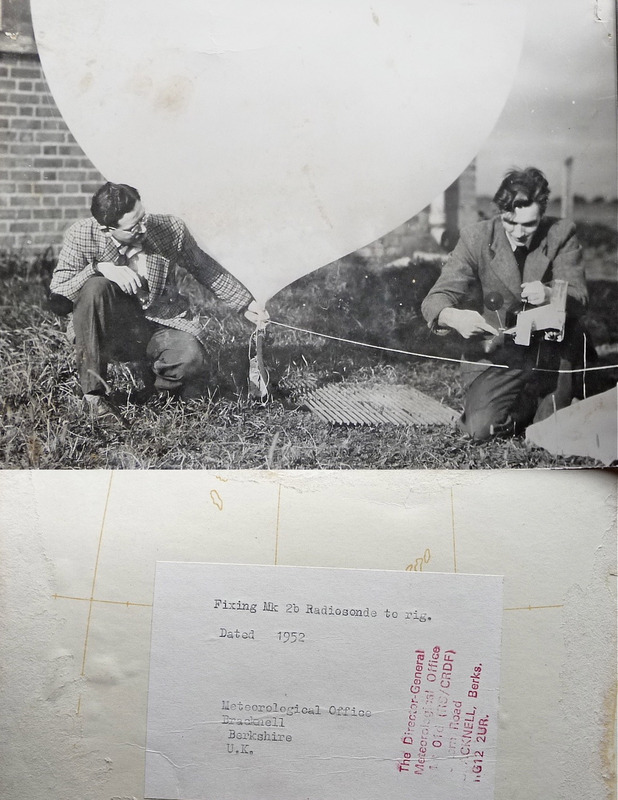 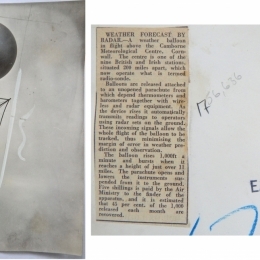 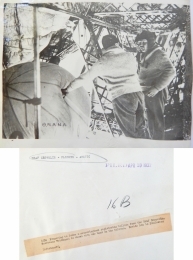 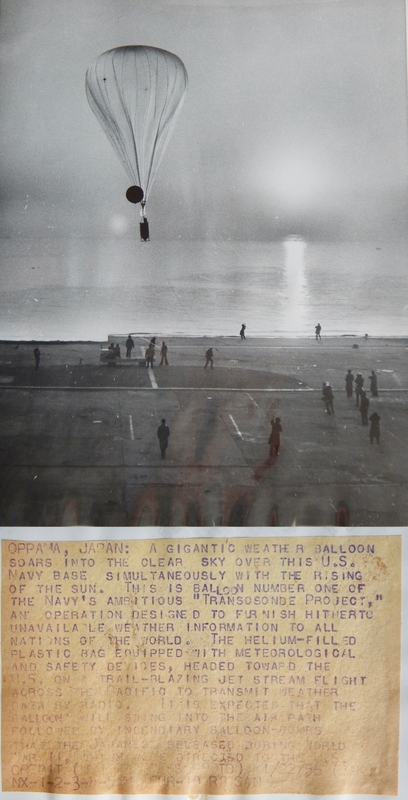 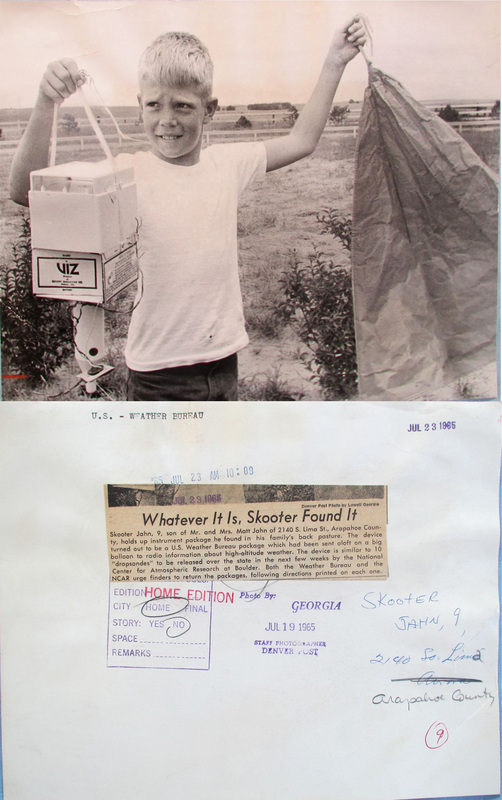 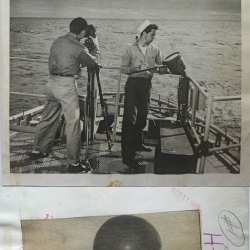 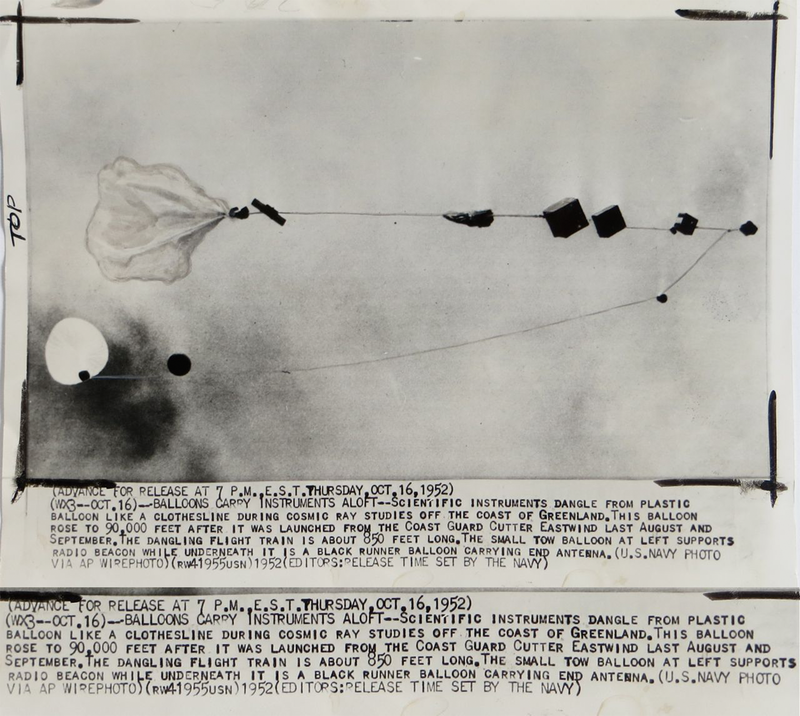 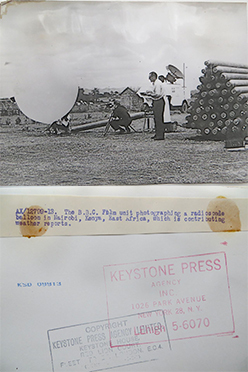 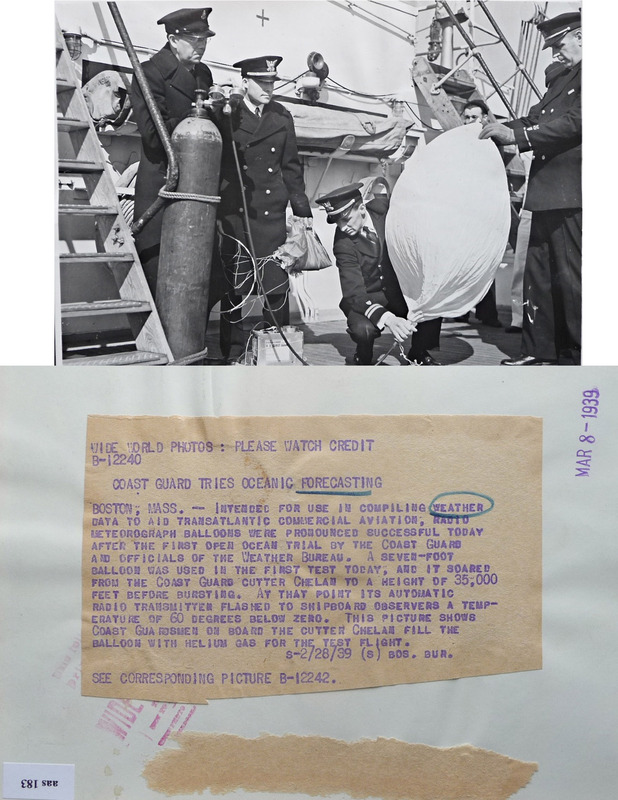 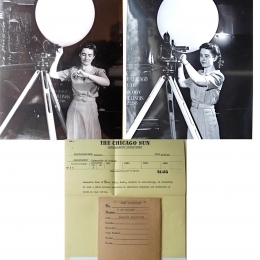 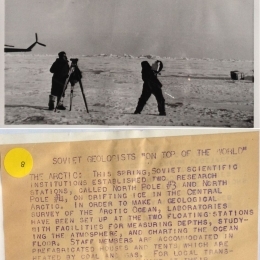 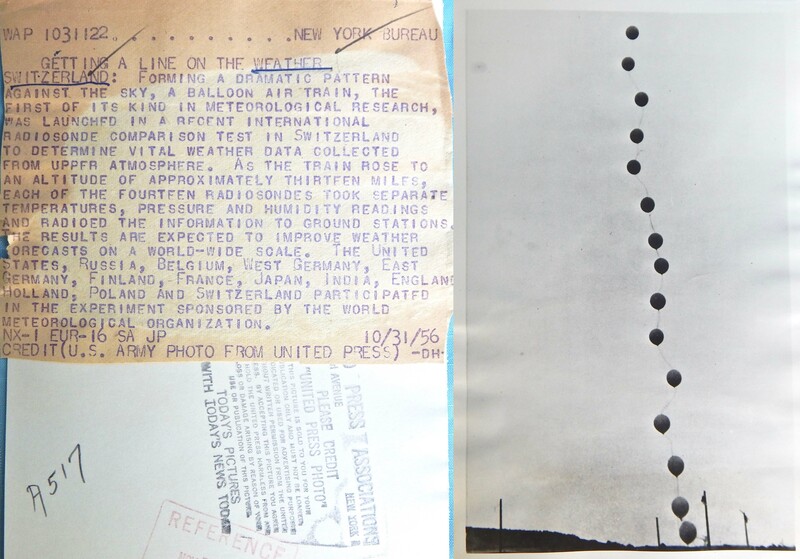 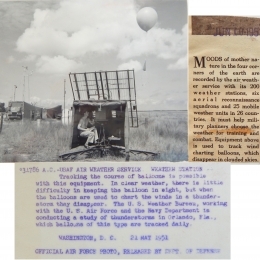 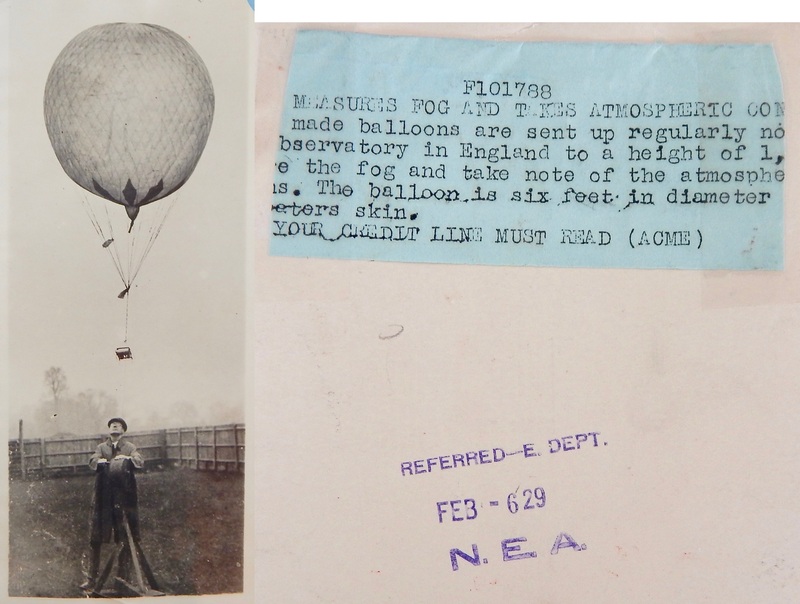 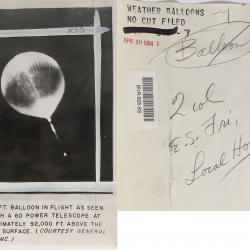 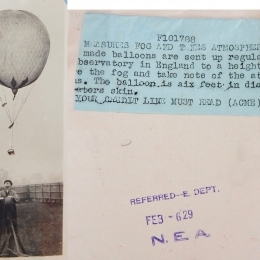 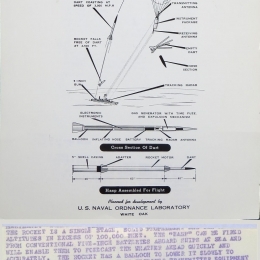 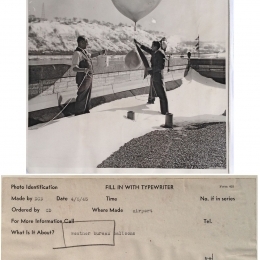 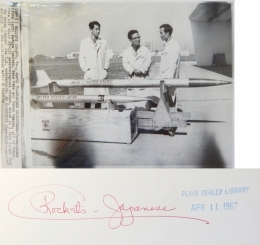 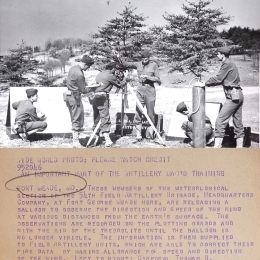 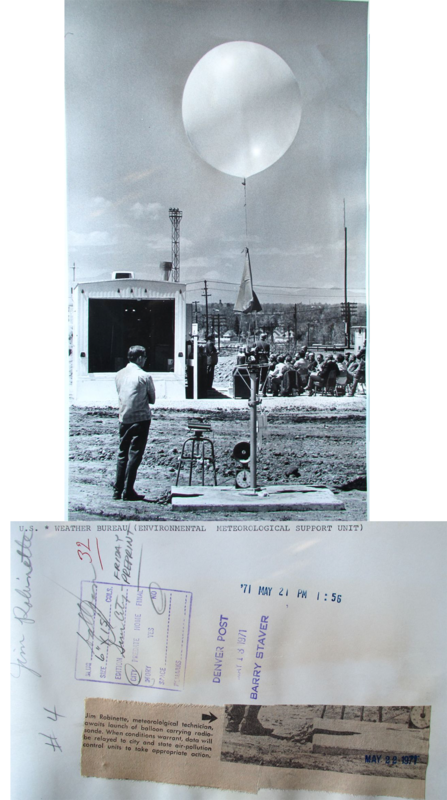 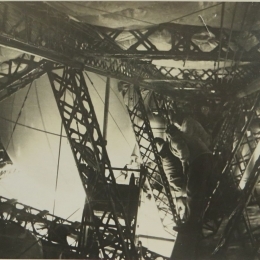 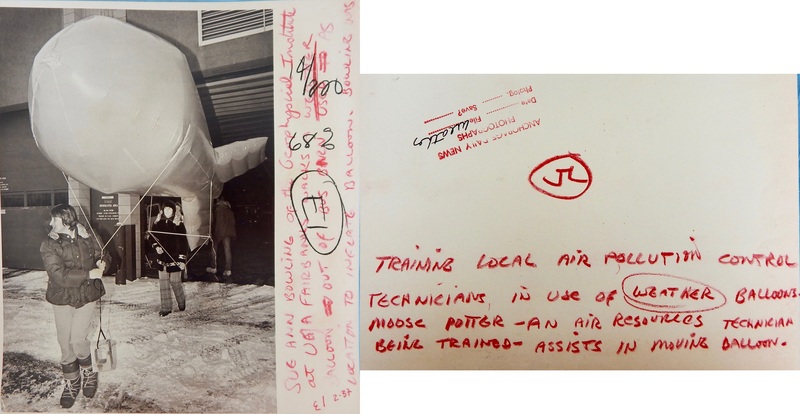 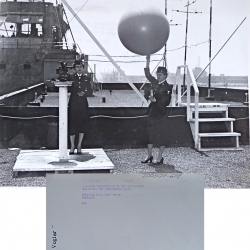 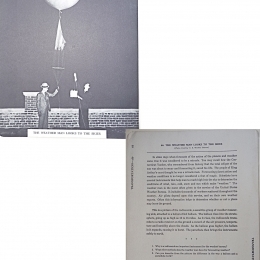 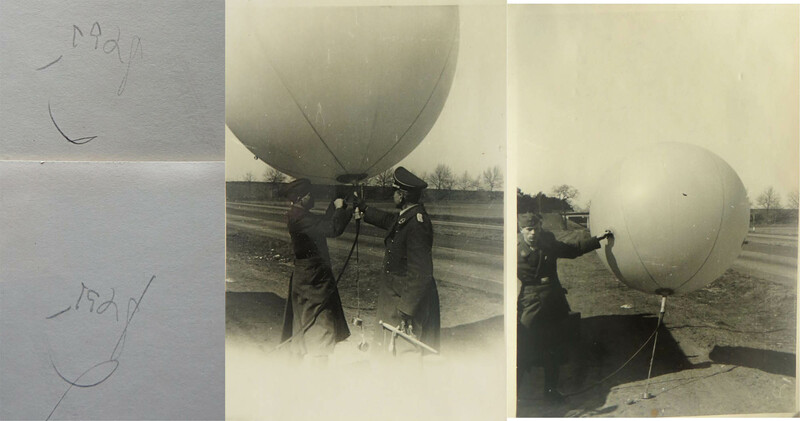 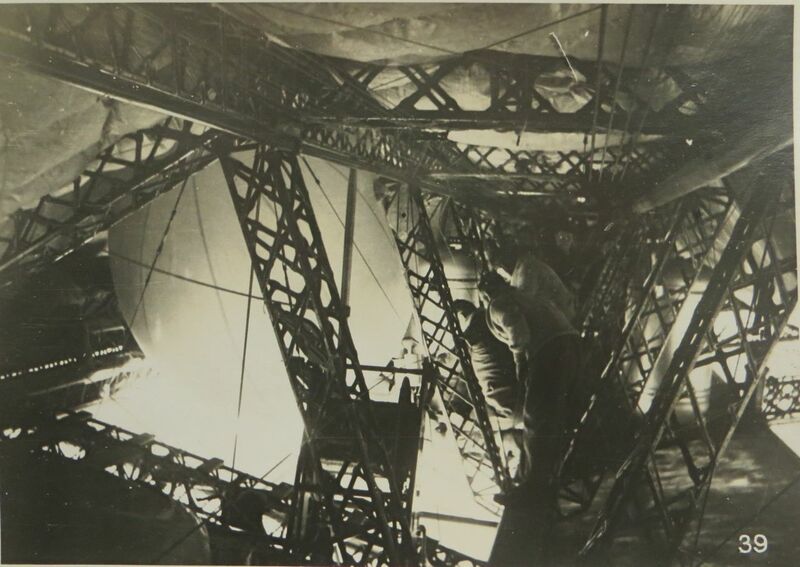 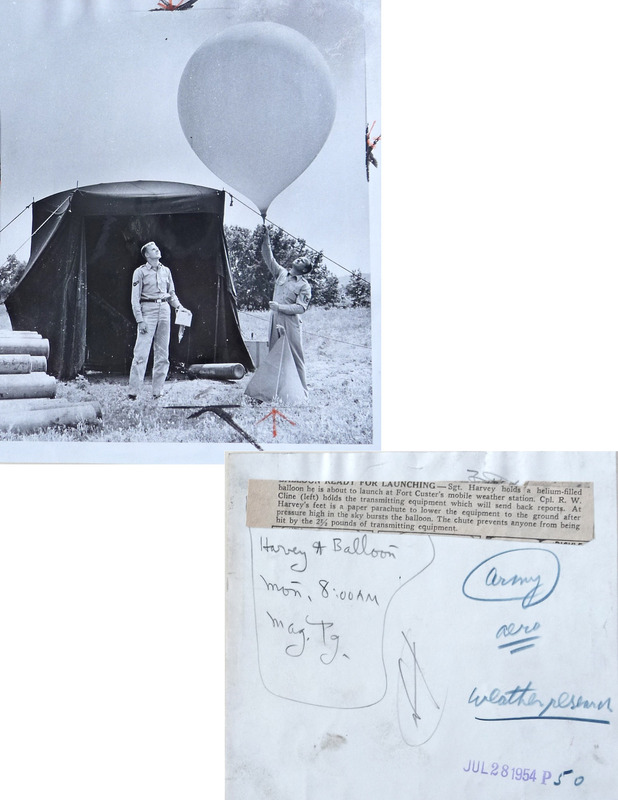 These photographic prints, arranged in chronological order, depict radiosondes (and the occasional pilot balloon) and related preparation, launch, tracking, and data-collection activities. 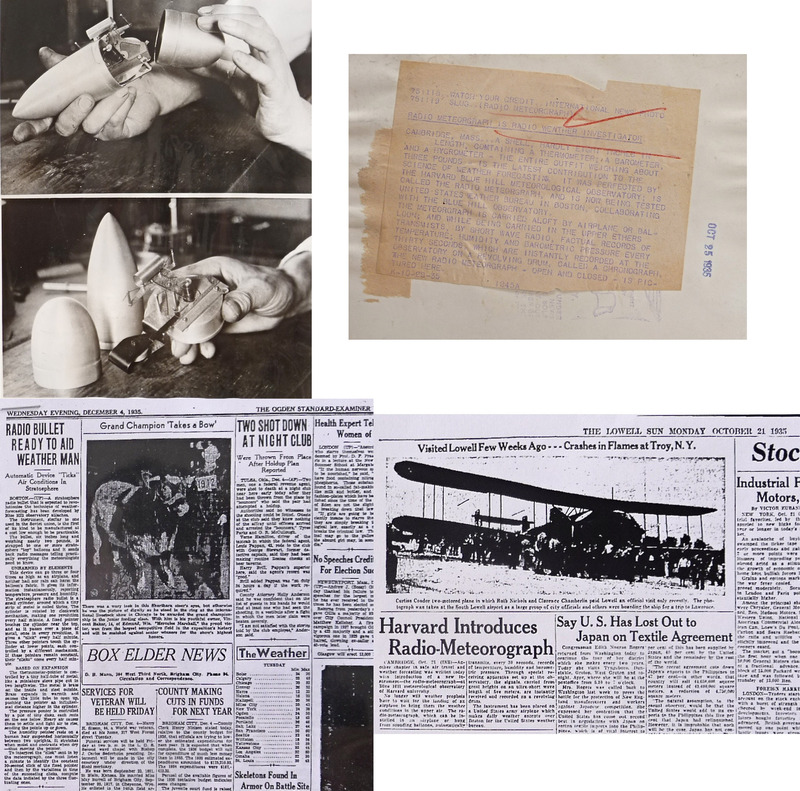 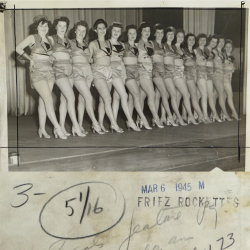 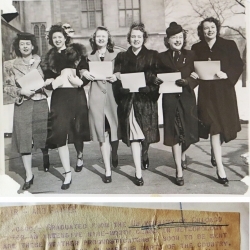 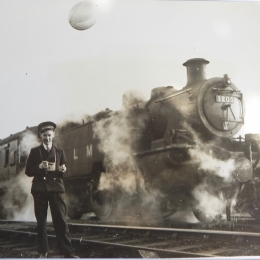 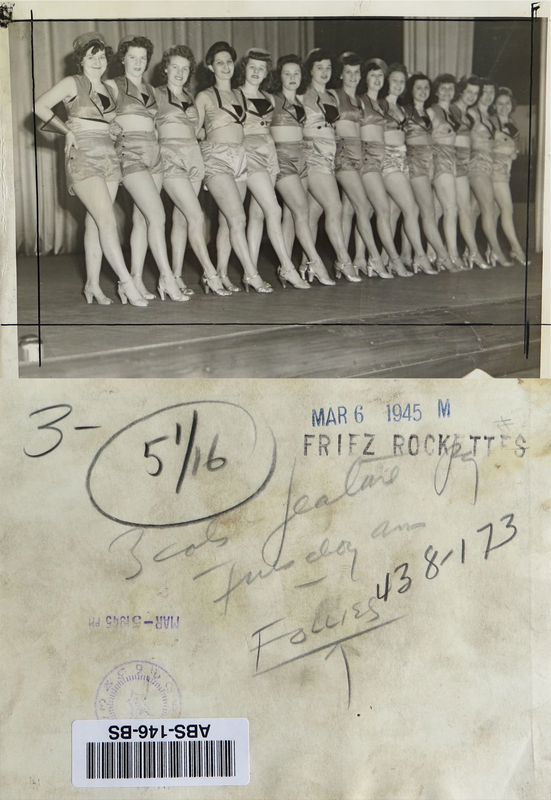 Some of these prints are from newspaper archives, some I bought on eBay (often without any provenance), and some were printed from negatives I purchased. 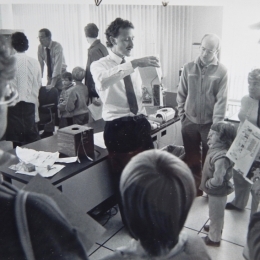 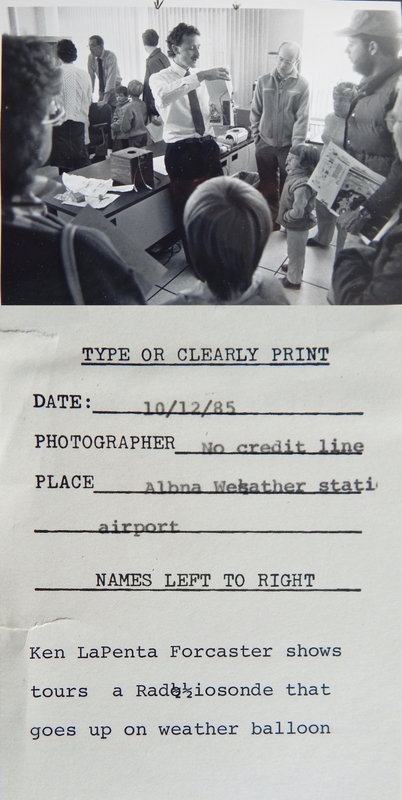 The photos are displayed in chronological order. 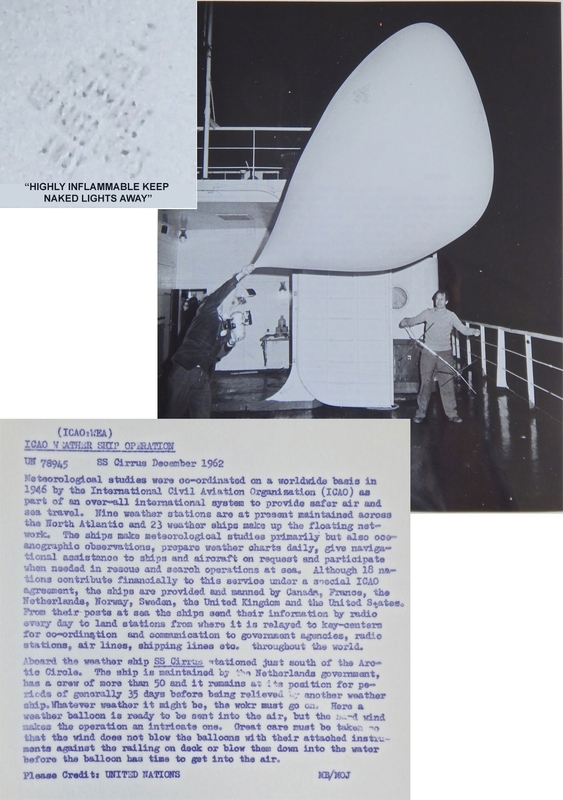 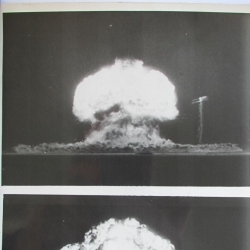 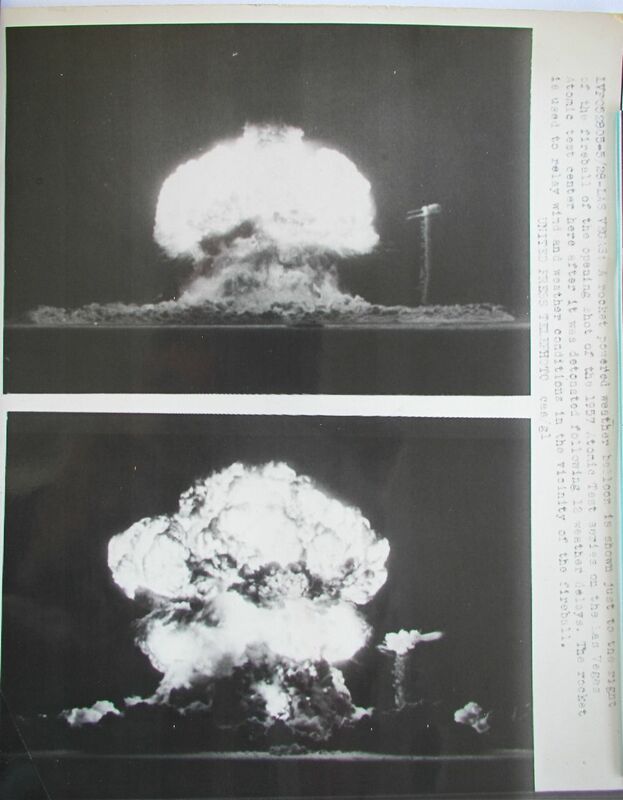 Click any photo to see a larger image. 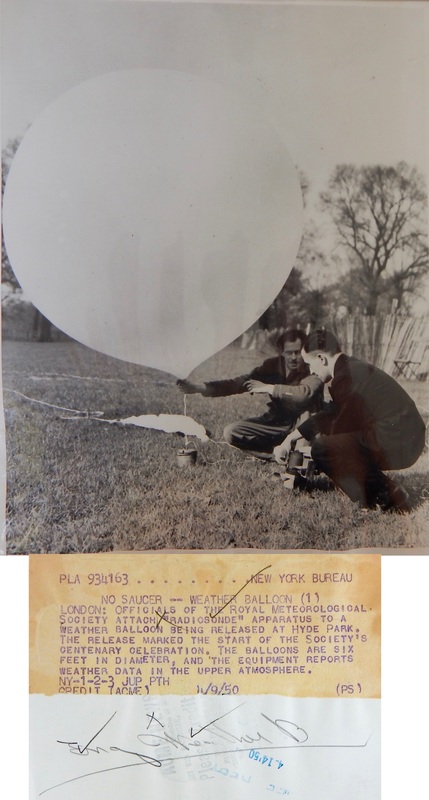 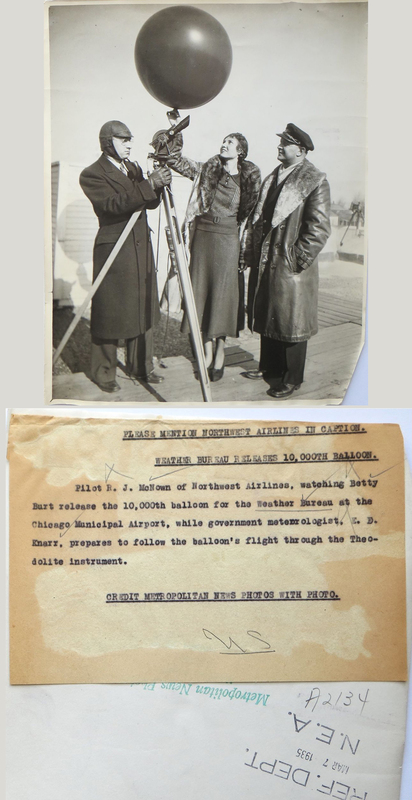 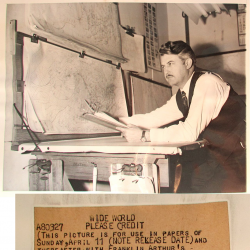 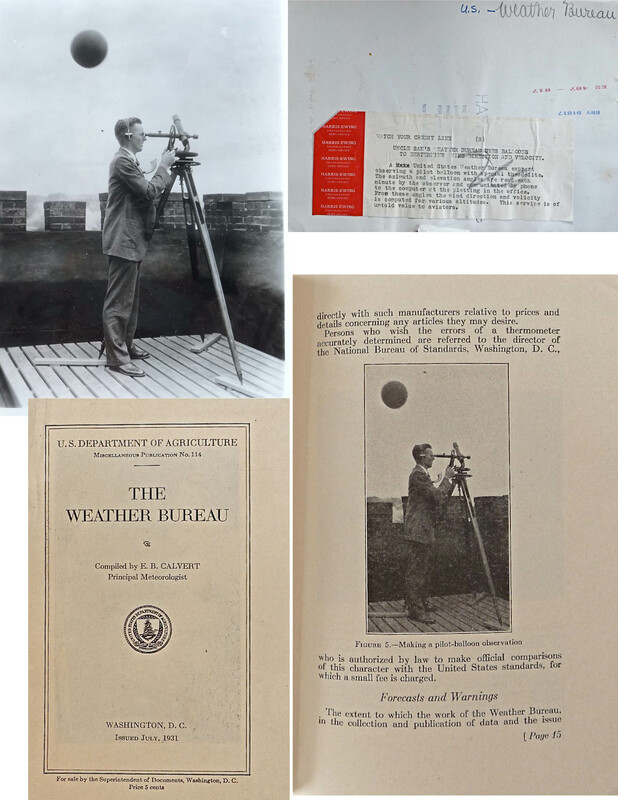 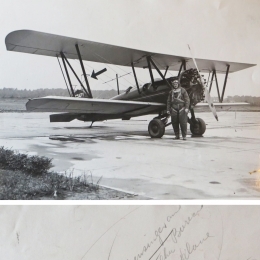 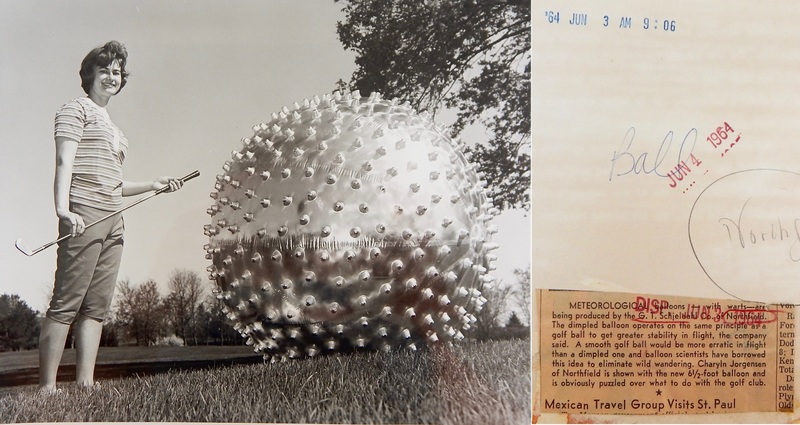 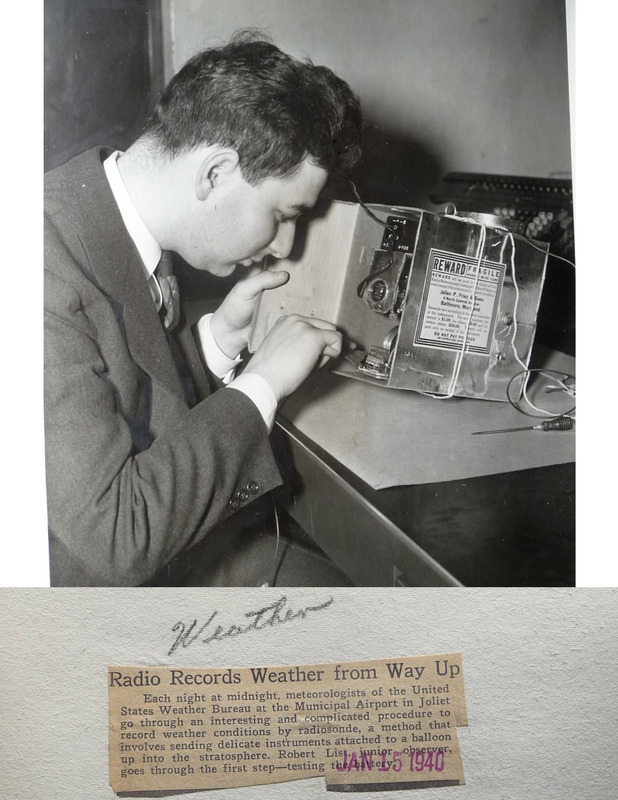 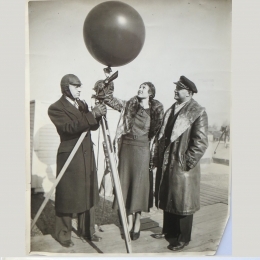 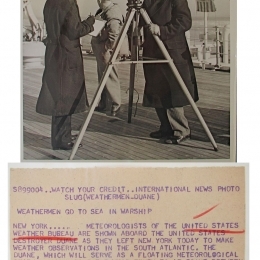 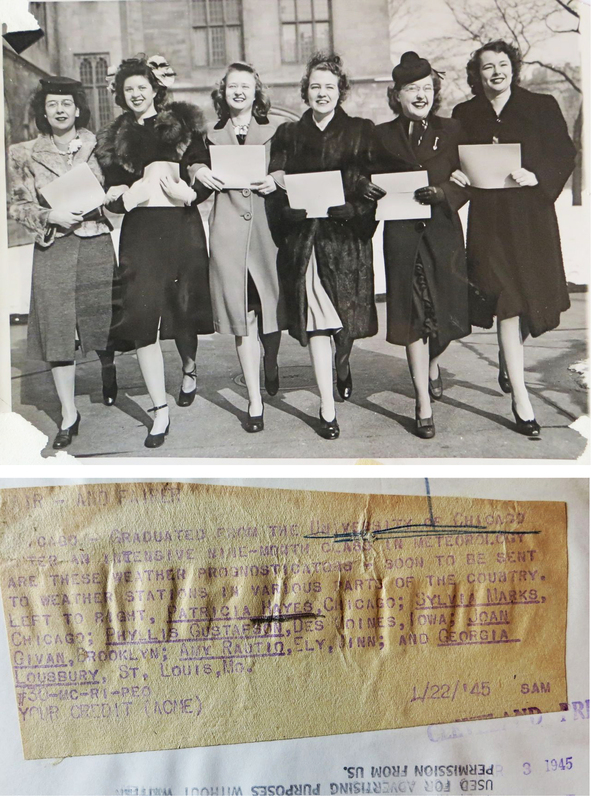 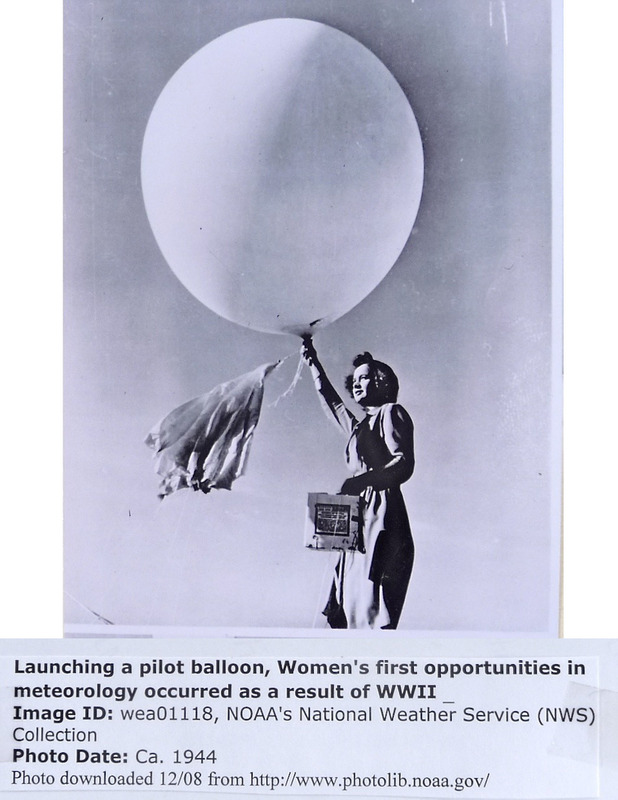 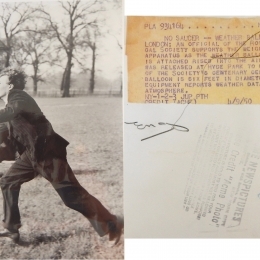 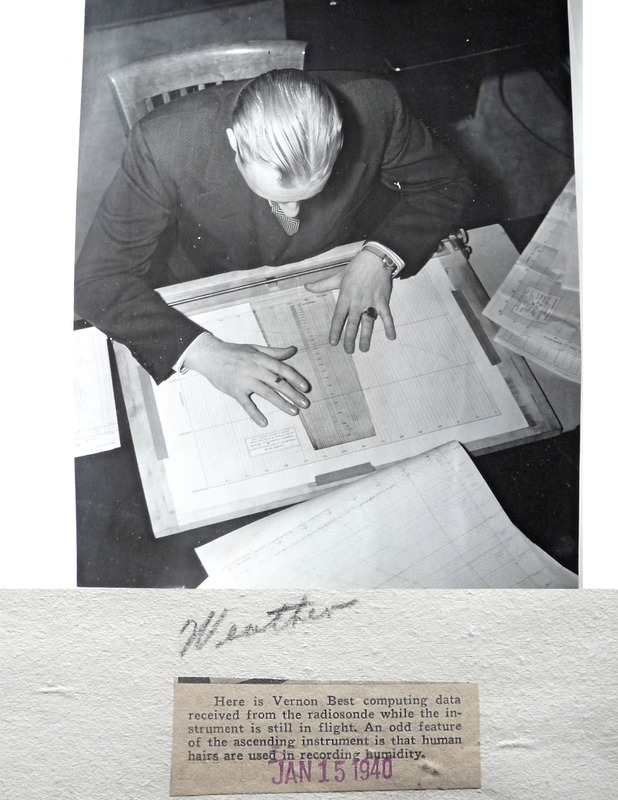 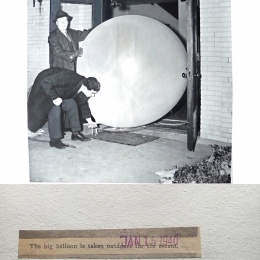 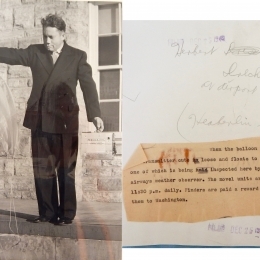 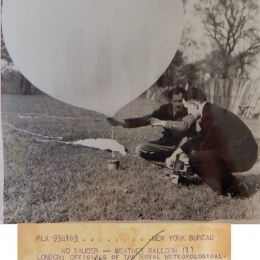 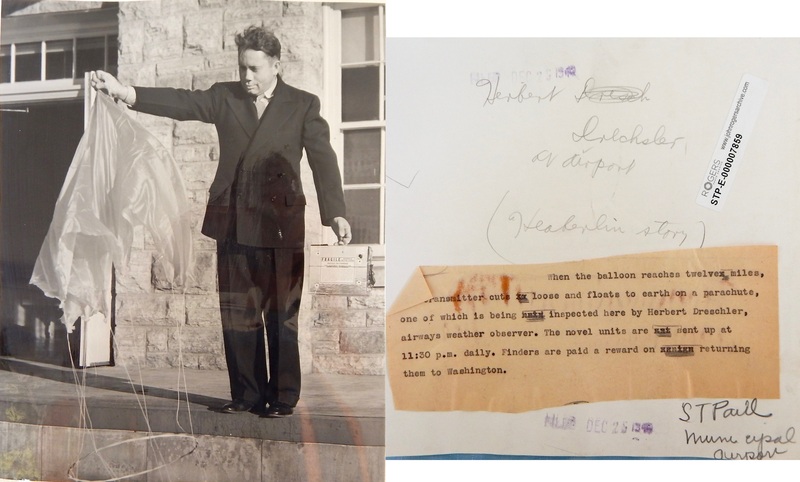 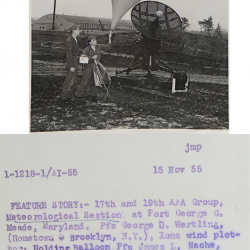 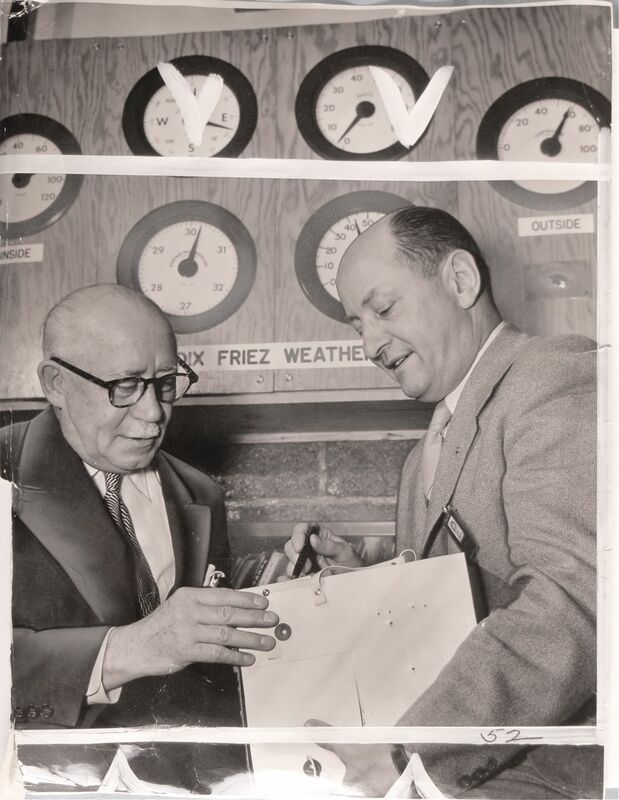 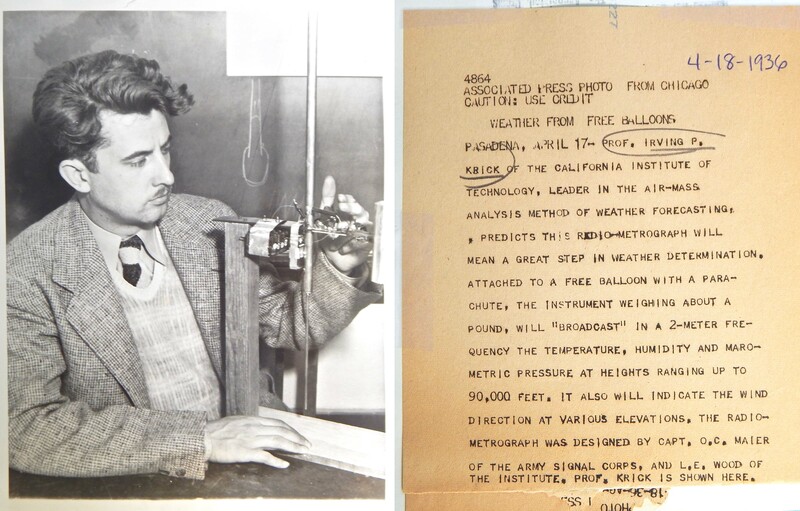 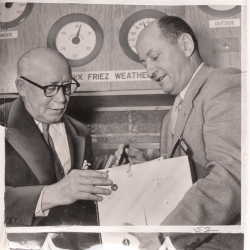 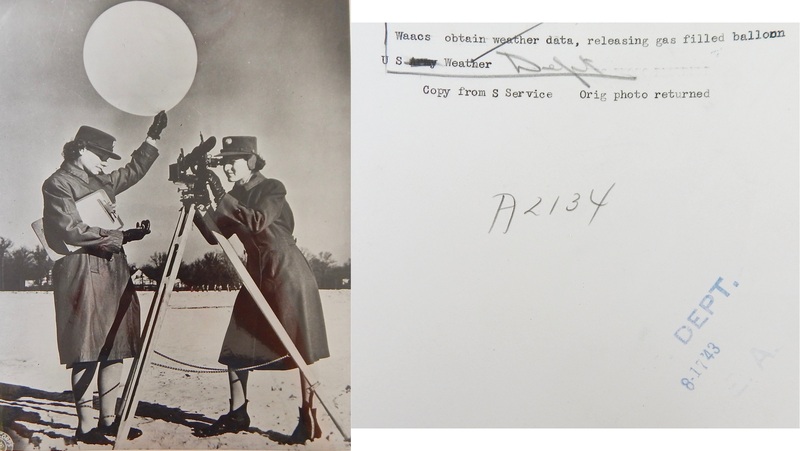 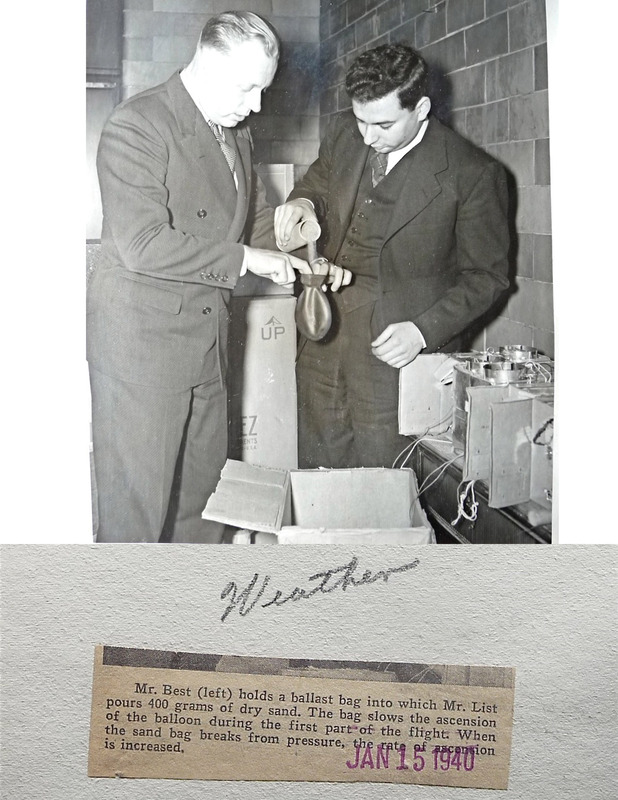 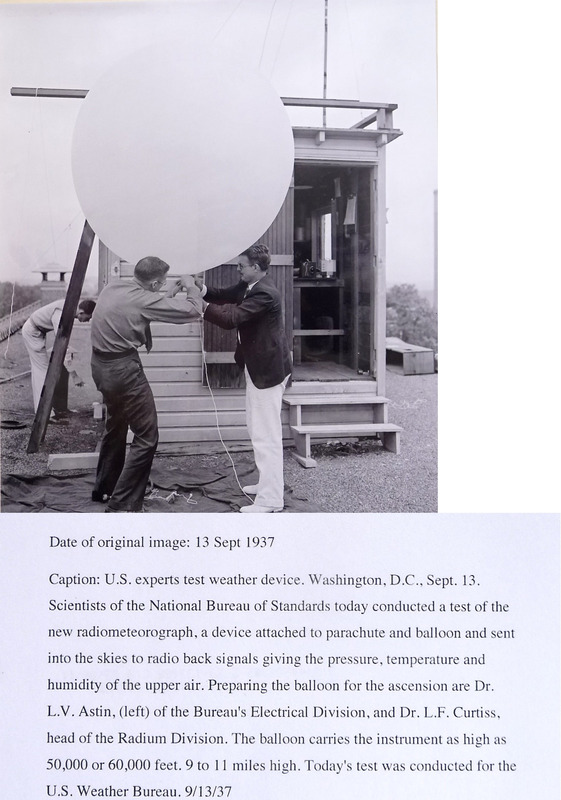 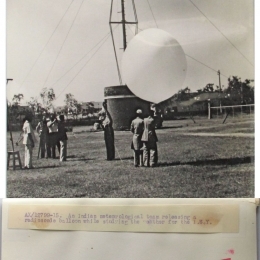 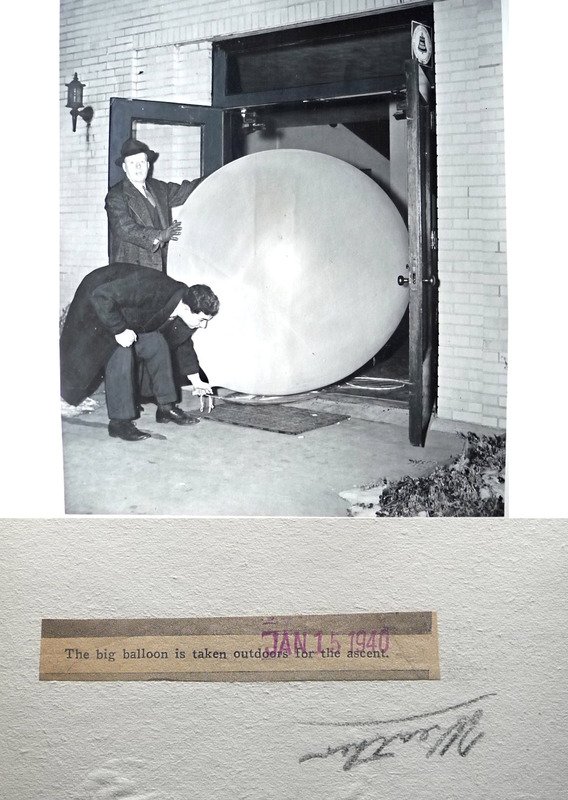 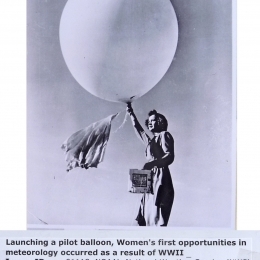 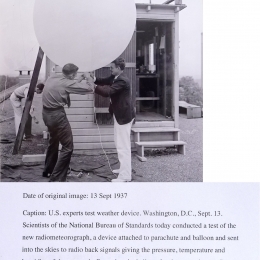 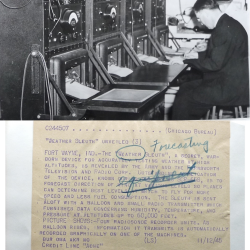 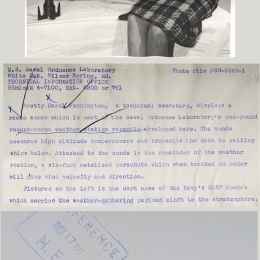 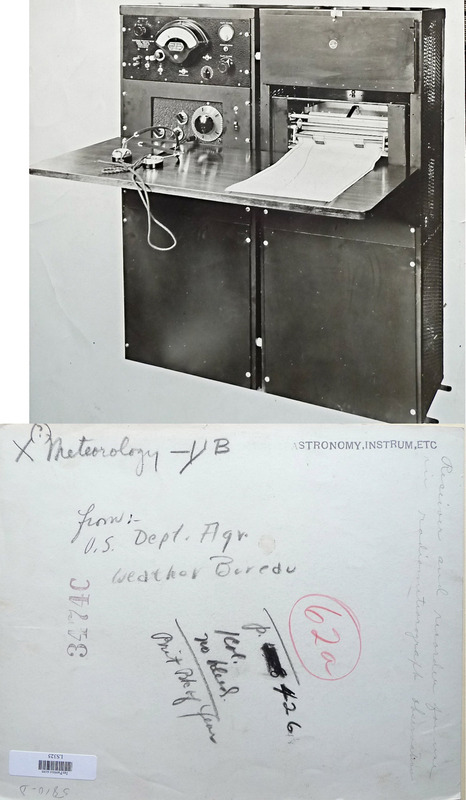 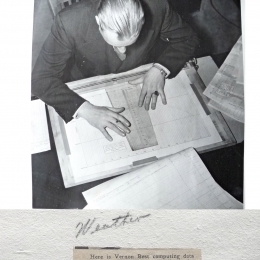 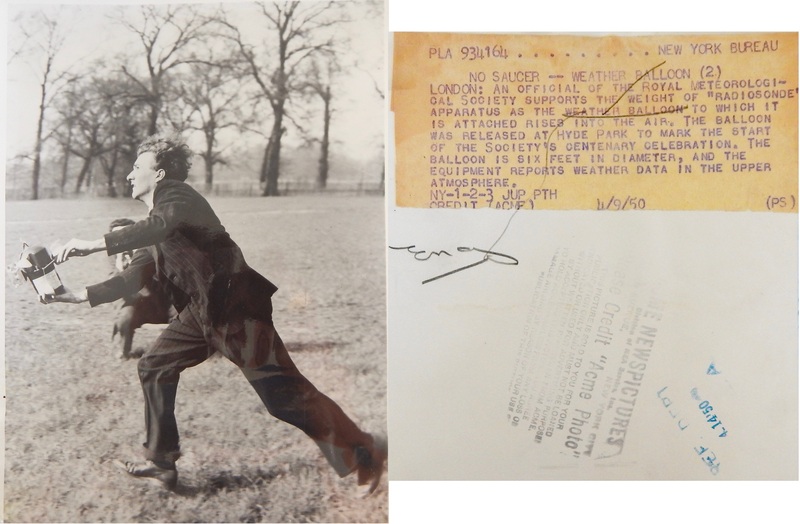 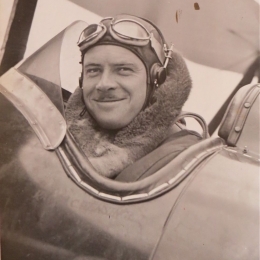 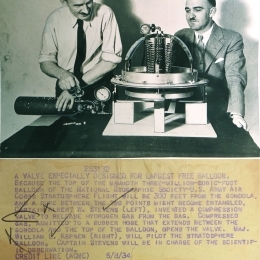 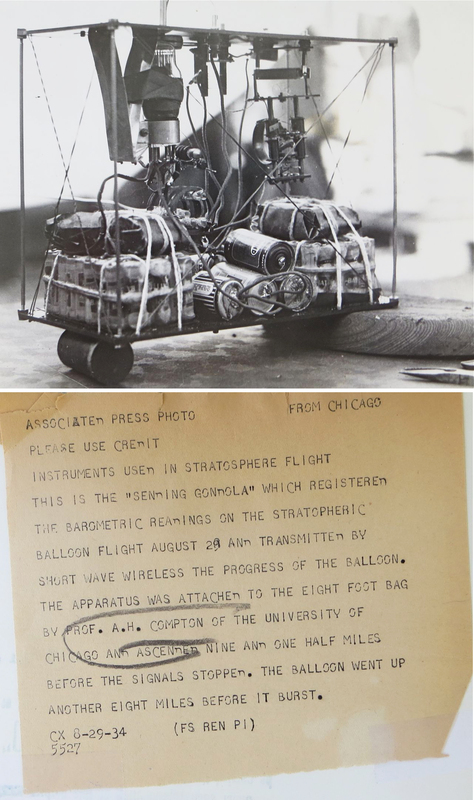 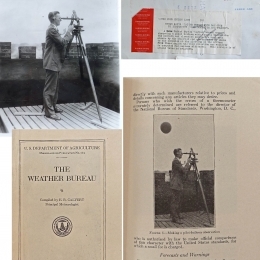 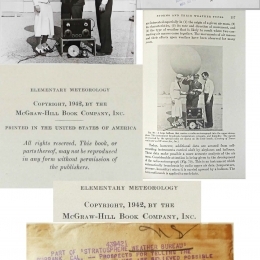 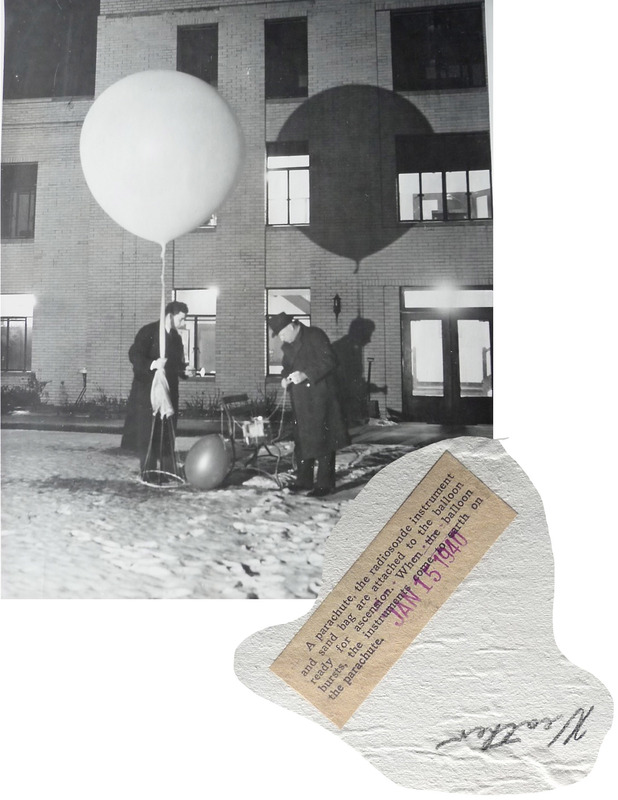 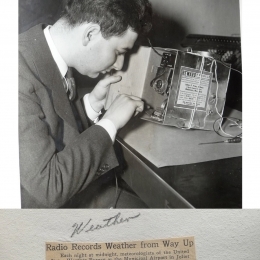 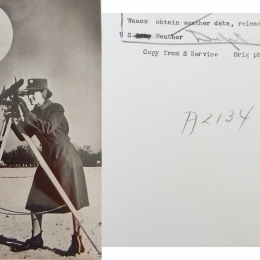 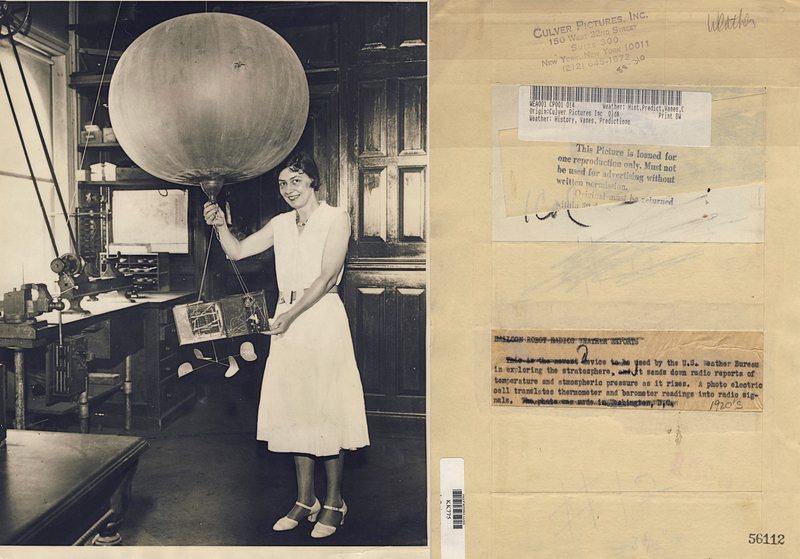 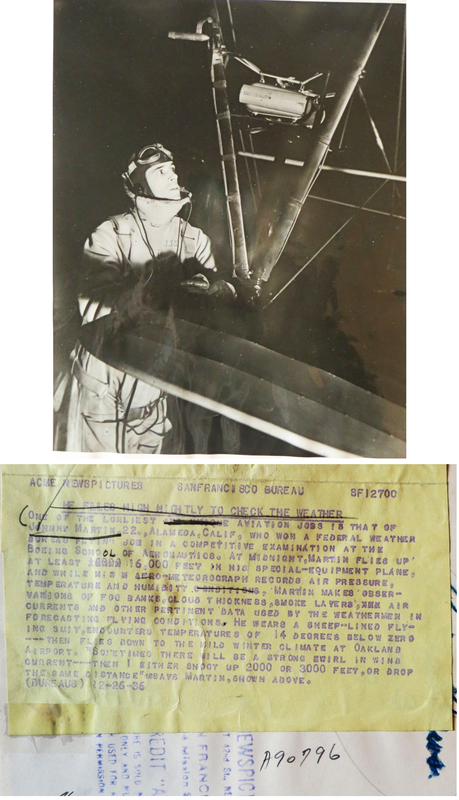 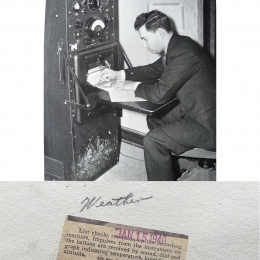 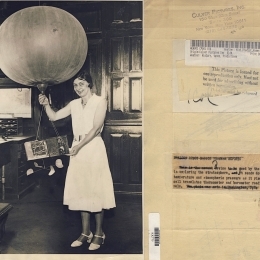 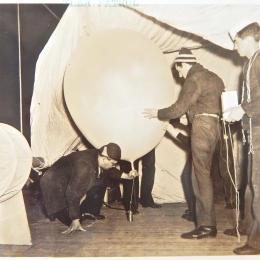 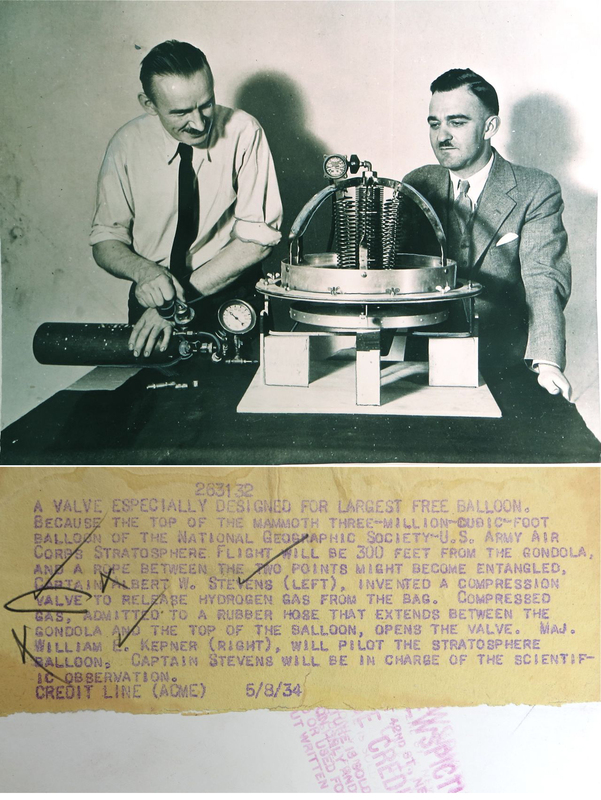 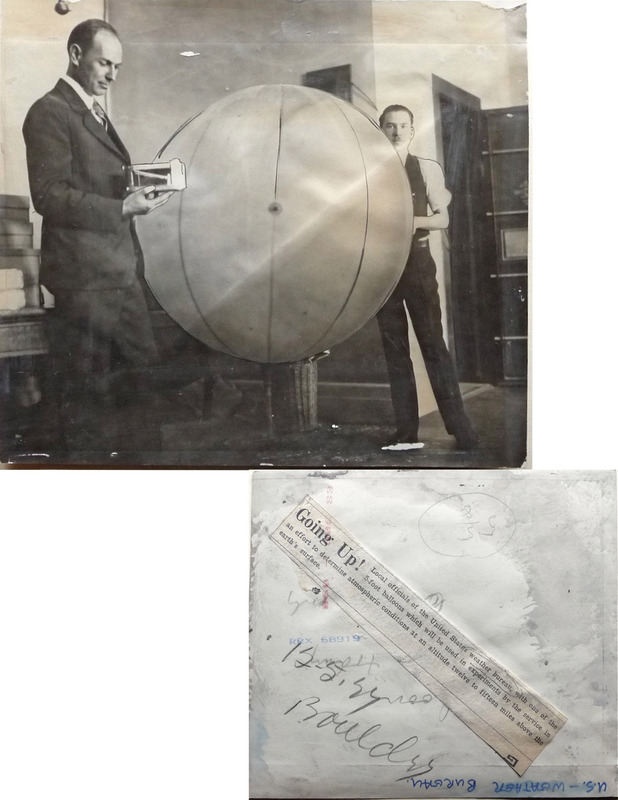 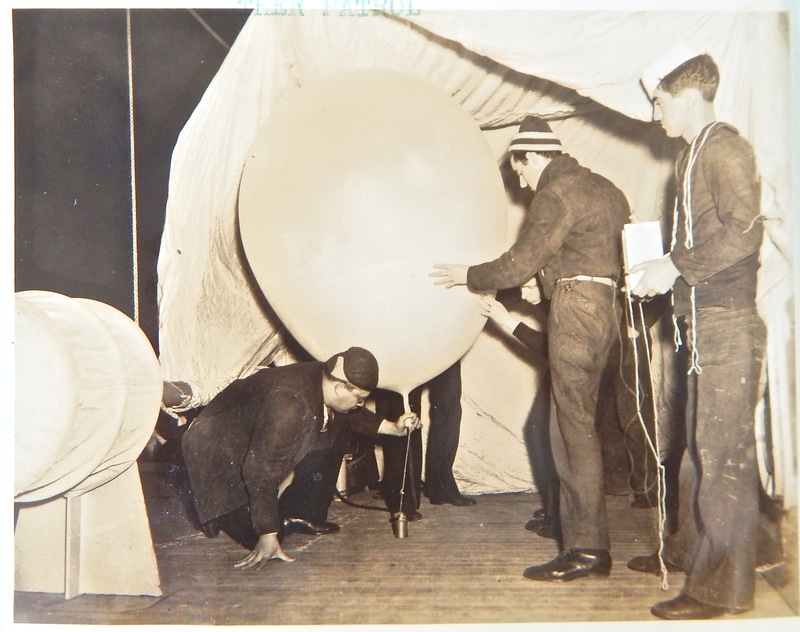 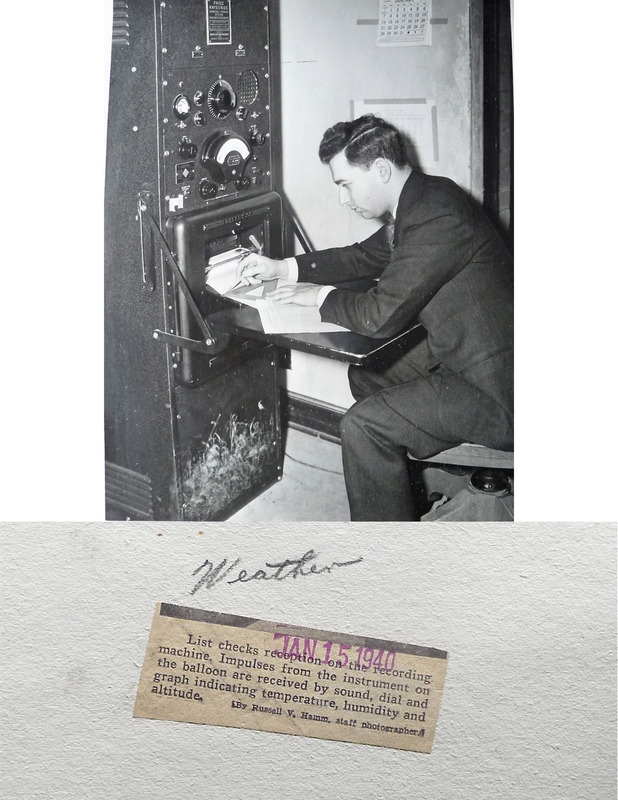 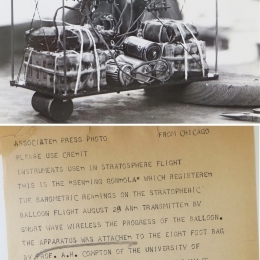 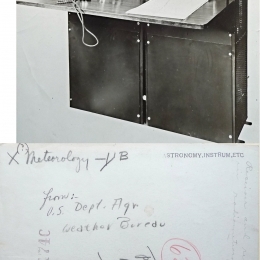 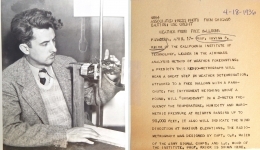 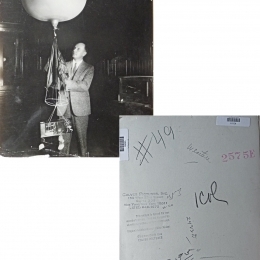 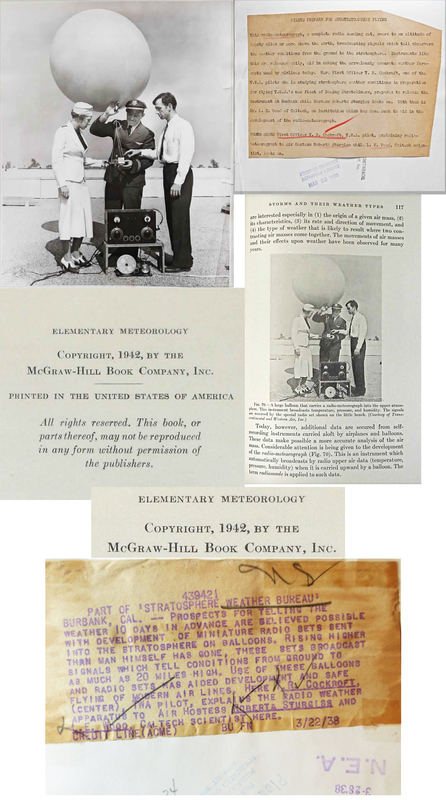 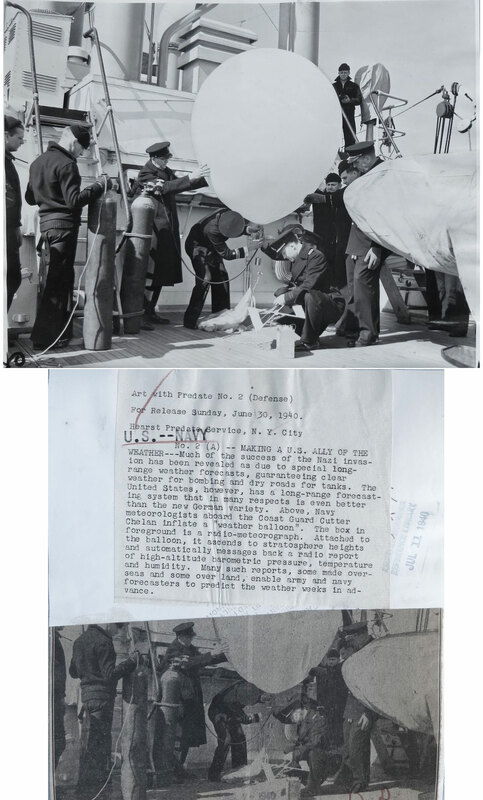 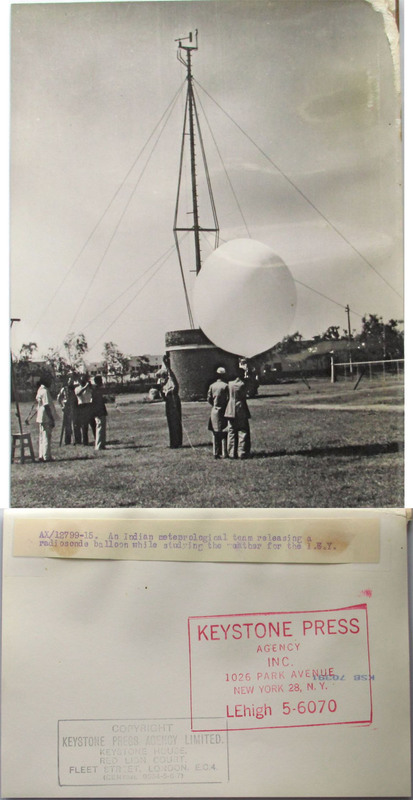 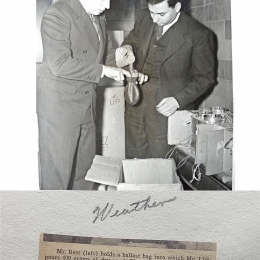 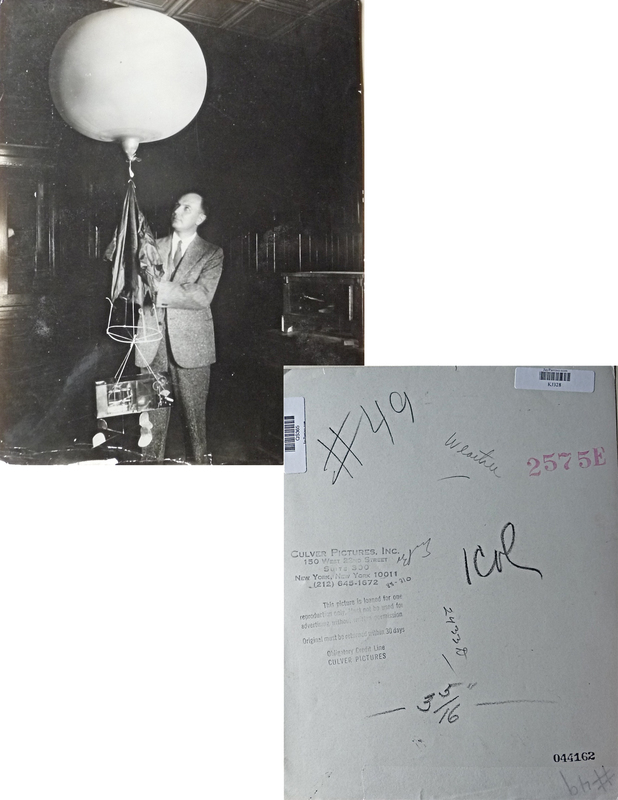 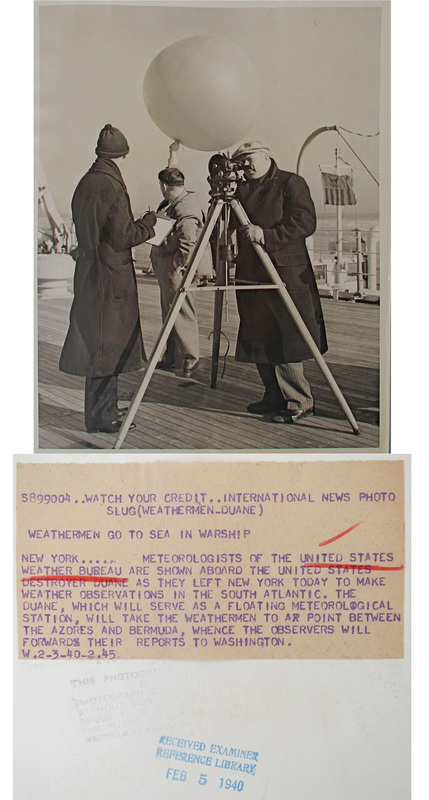 1919--USDA Employee Measuring "Free Lift"
1937--Karl O. Lange of Blue Hills Meteorological Observatory Launches Radiosonde at Columbia University, New York. 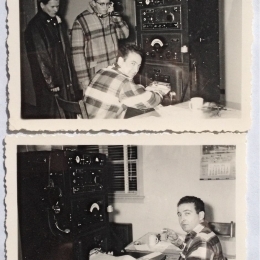 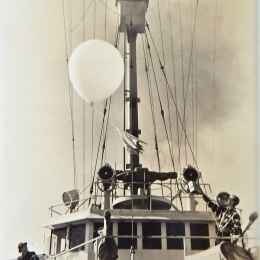 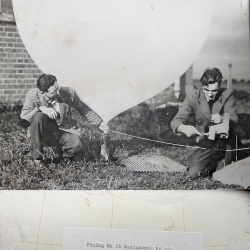 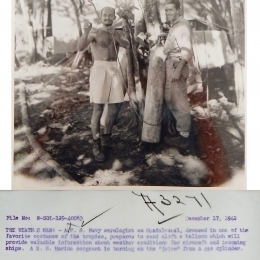 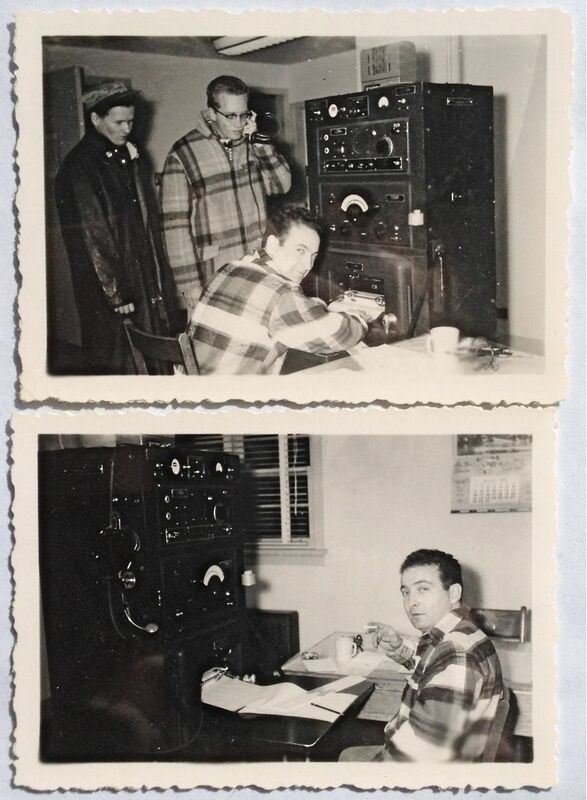 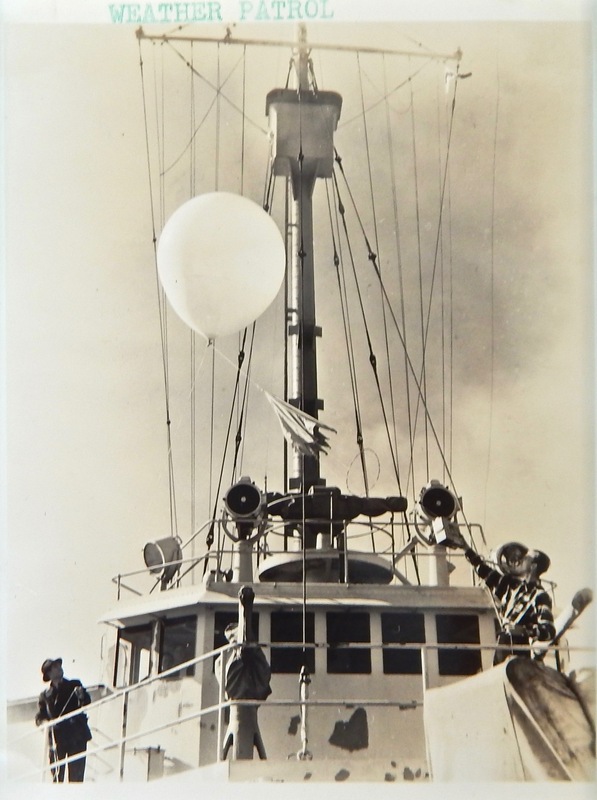 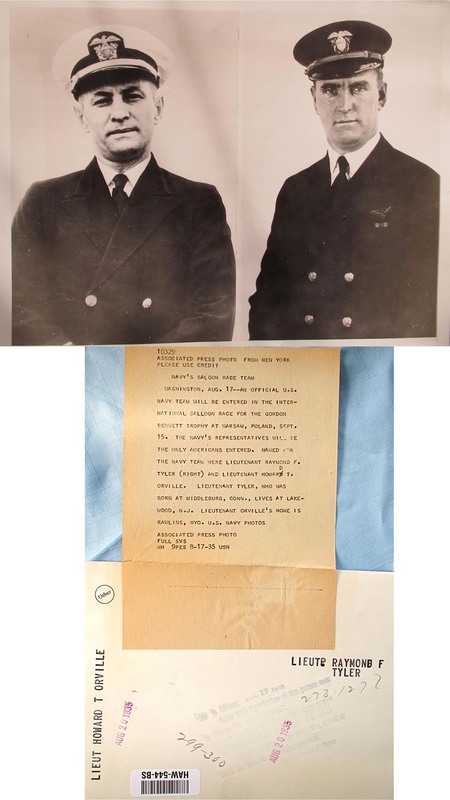 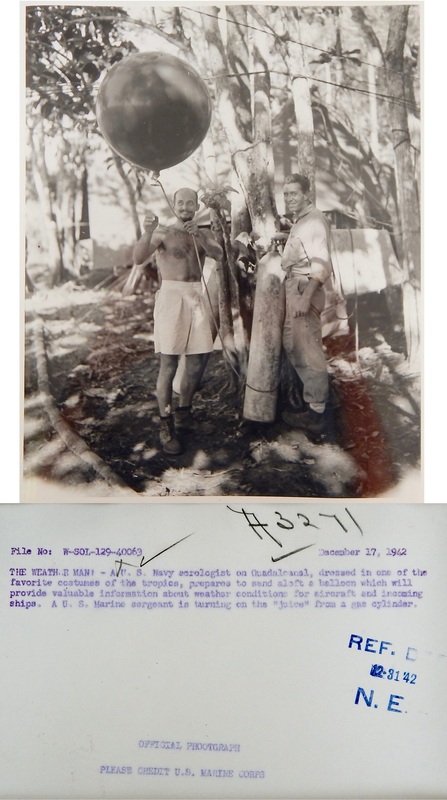 1942--Radiosonde Crew, Port Hardy, B.C. 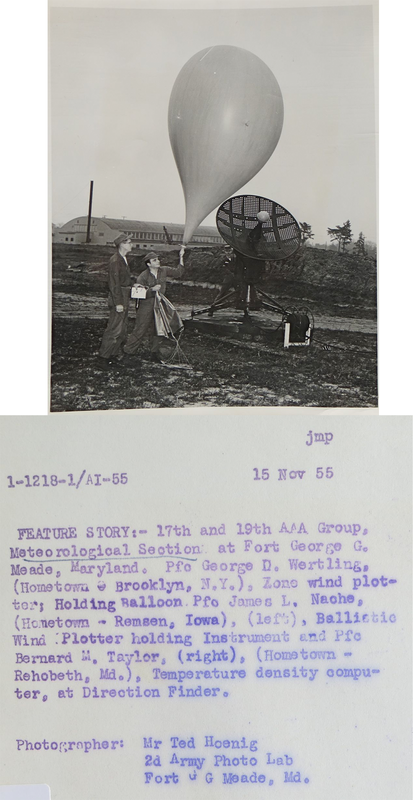 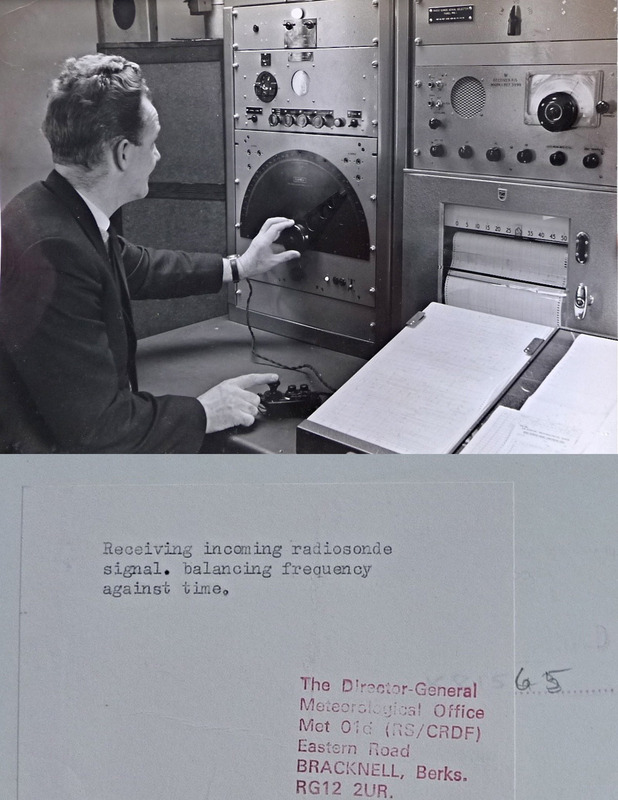 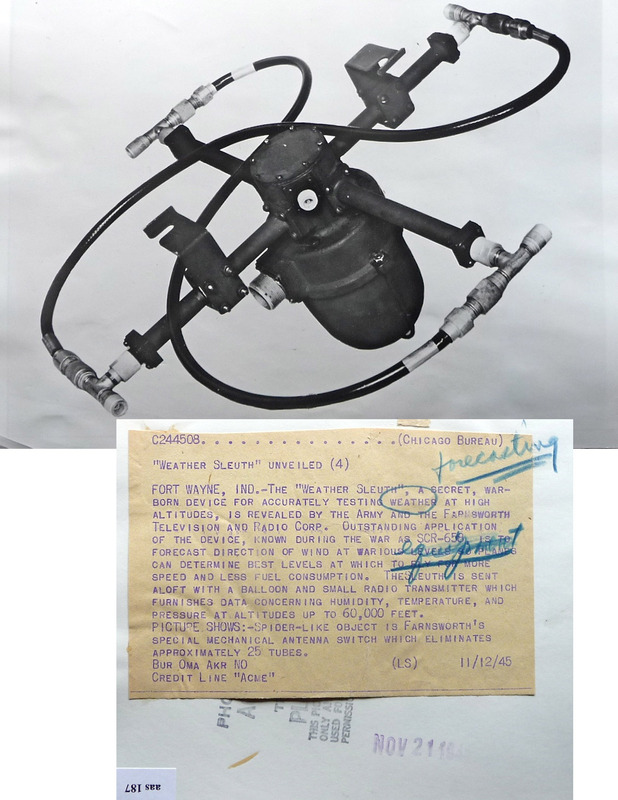 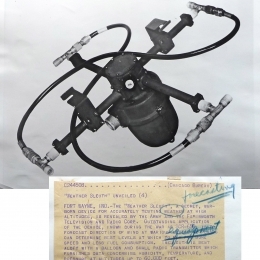 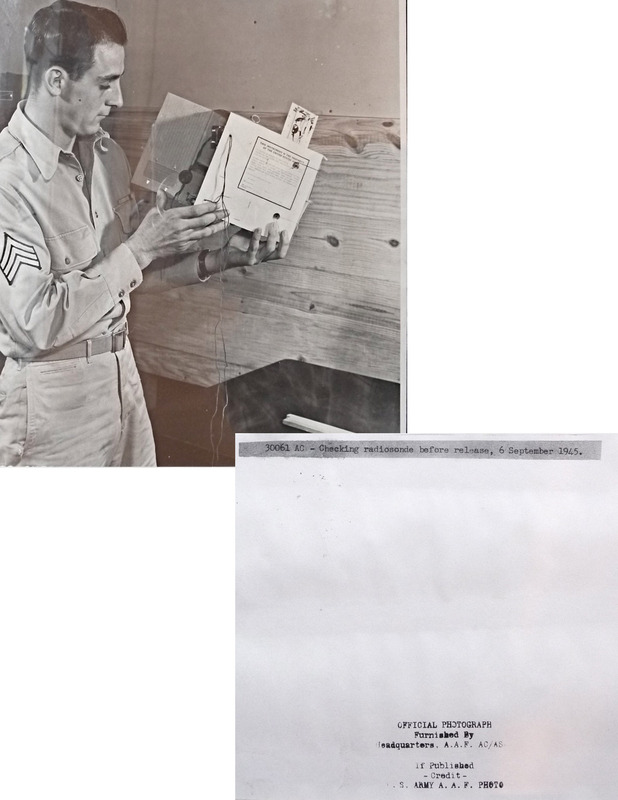 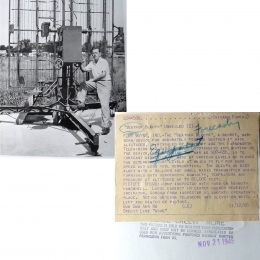 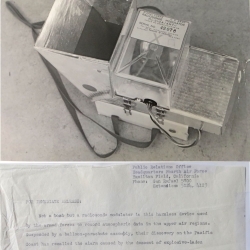 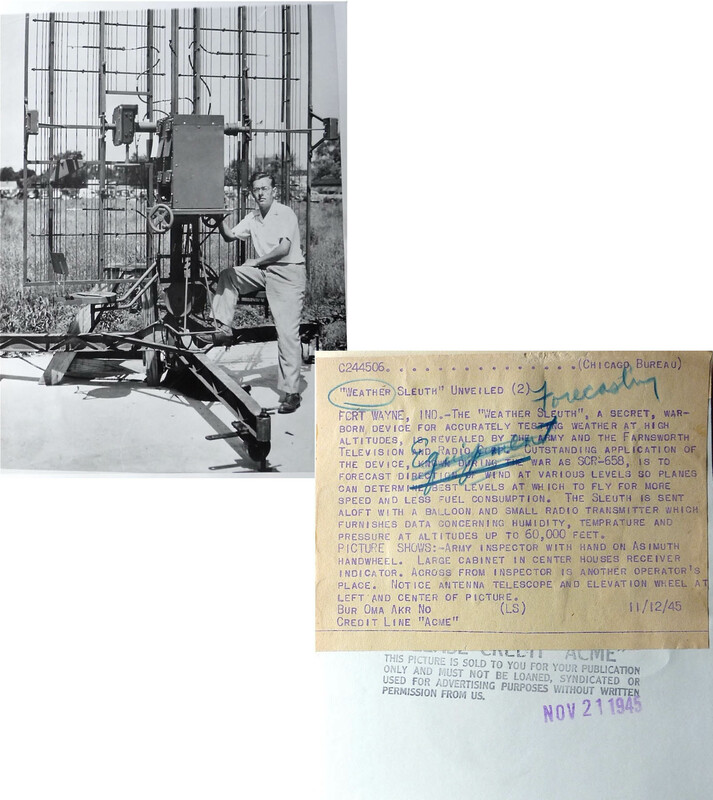 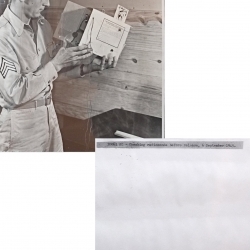 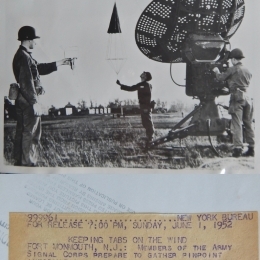 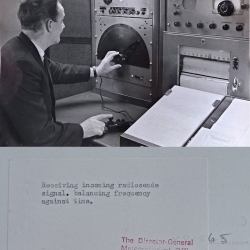 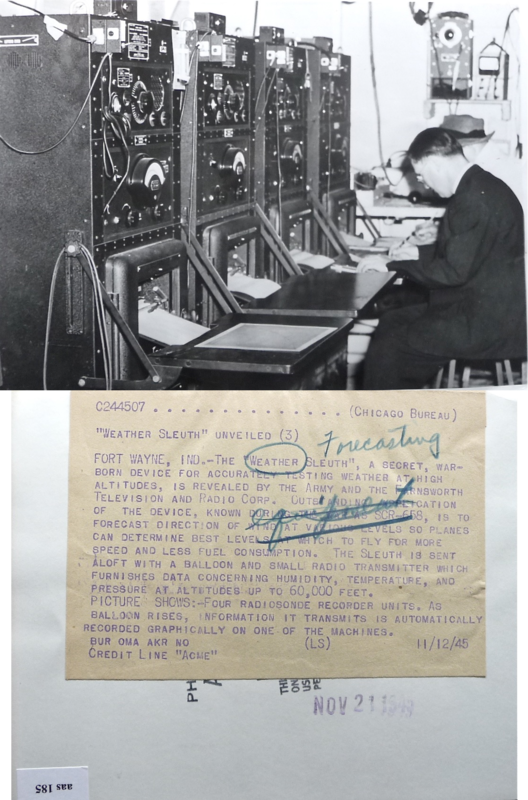 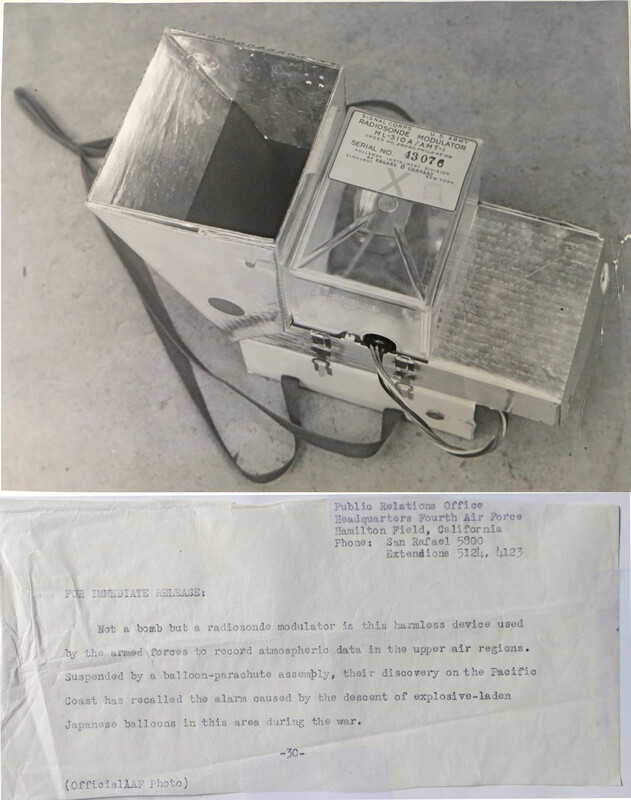 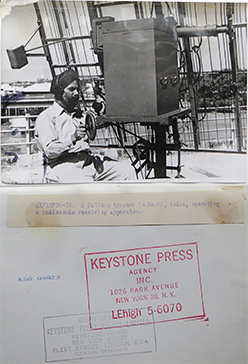 1947 (or earlier)--ML-310A/AMT-1 Modulator (AAF) on (possibly) T-69A-AMT-1 Radiosonde. 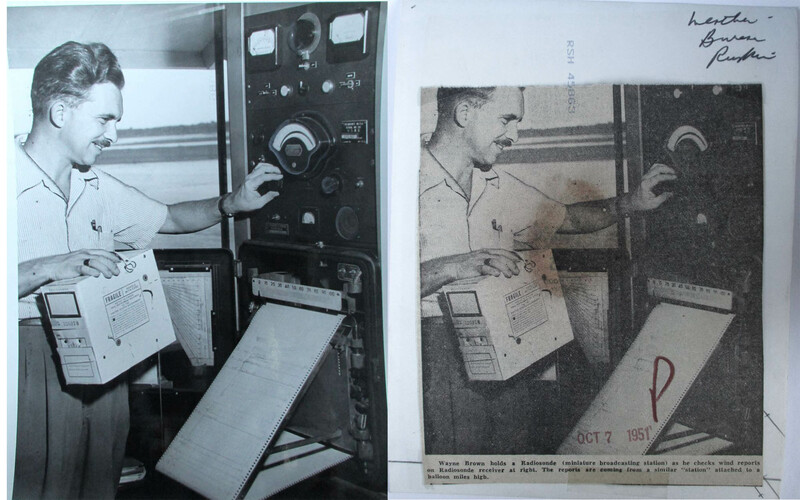 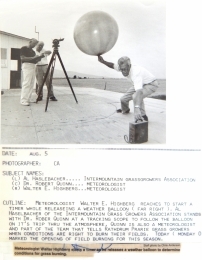 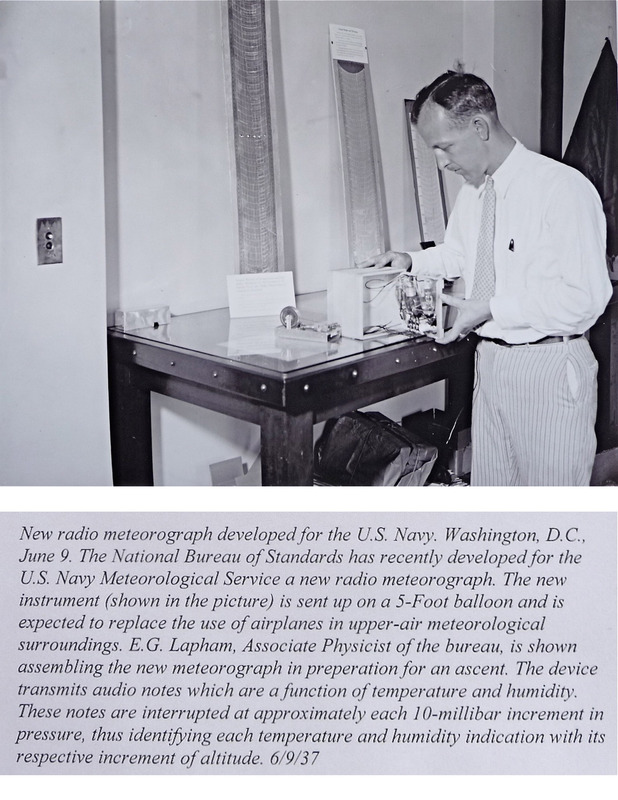 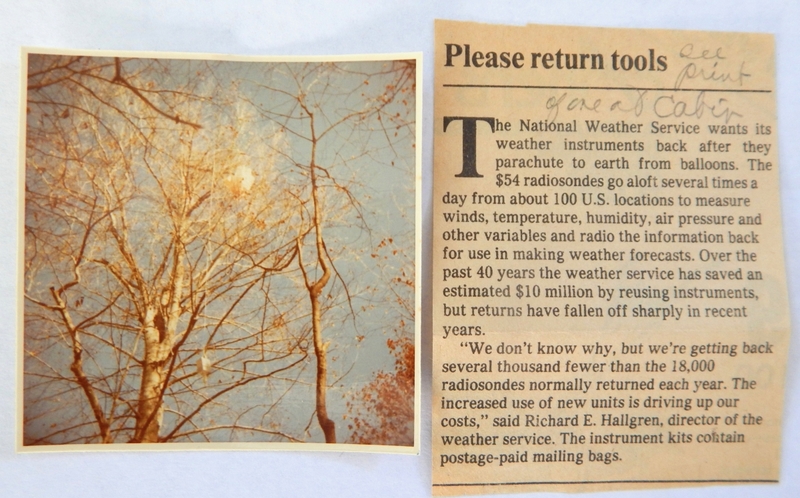 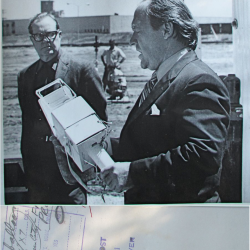 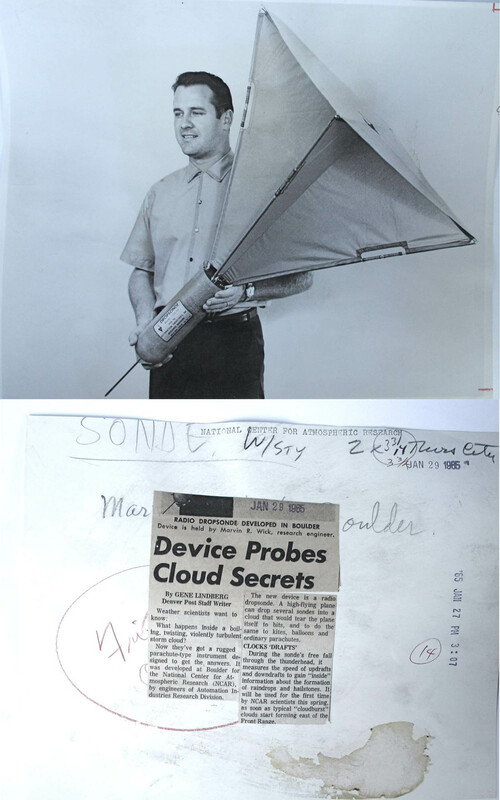 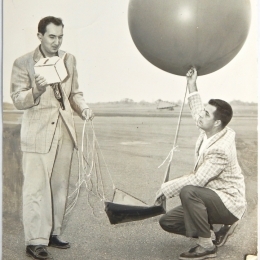 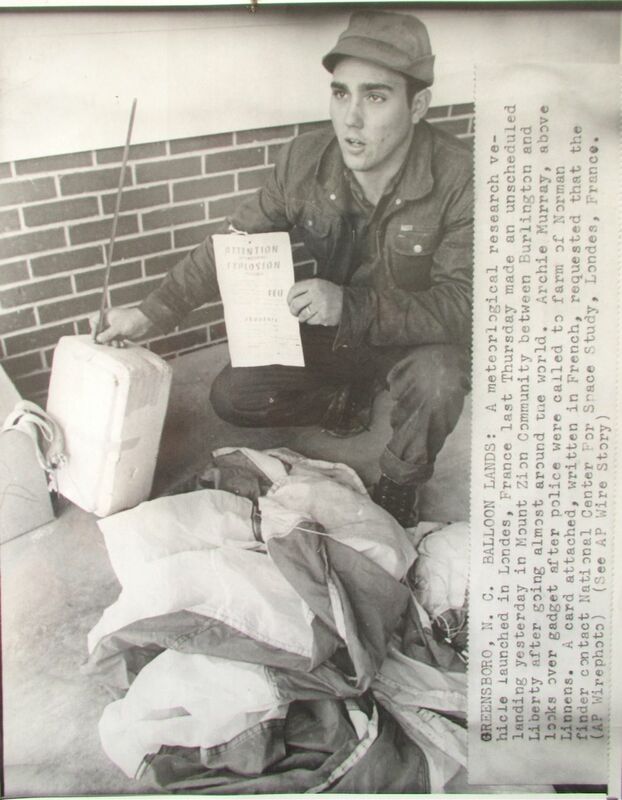 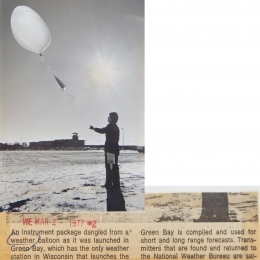 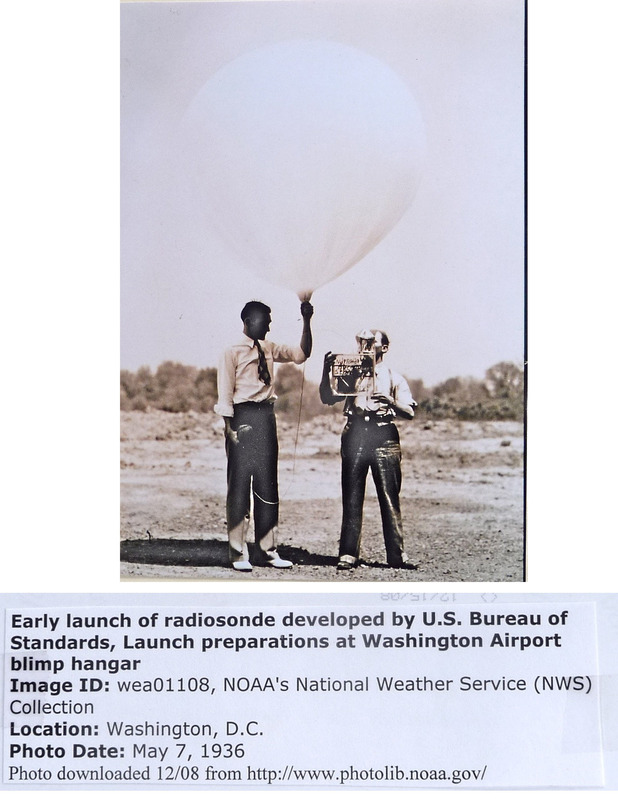 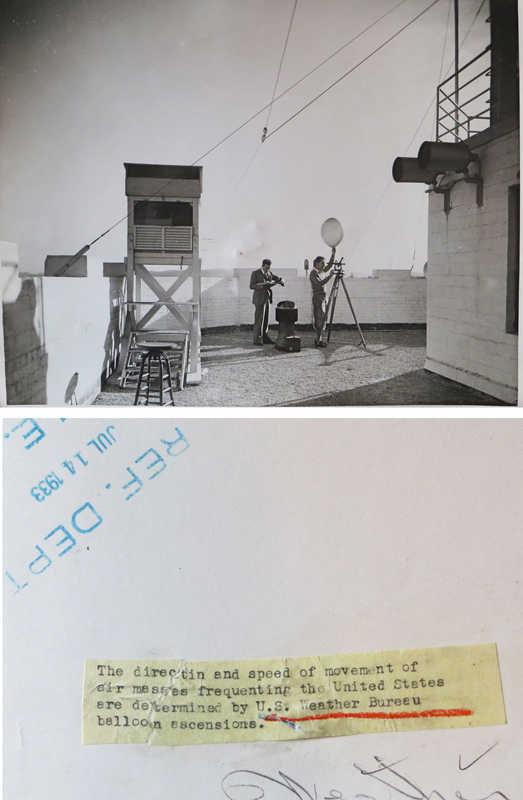 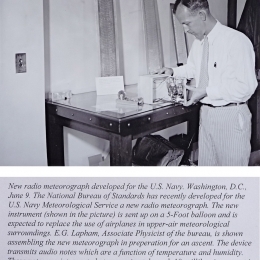 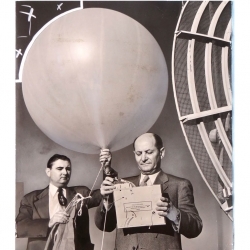 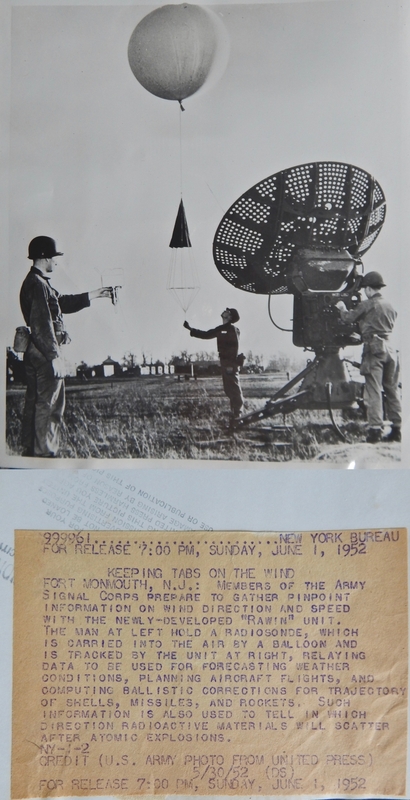 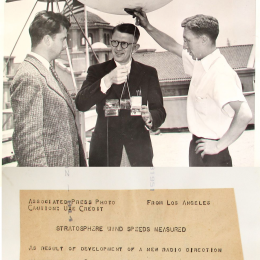 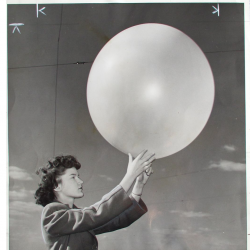 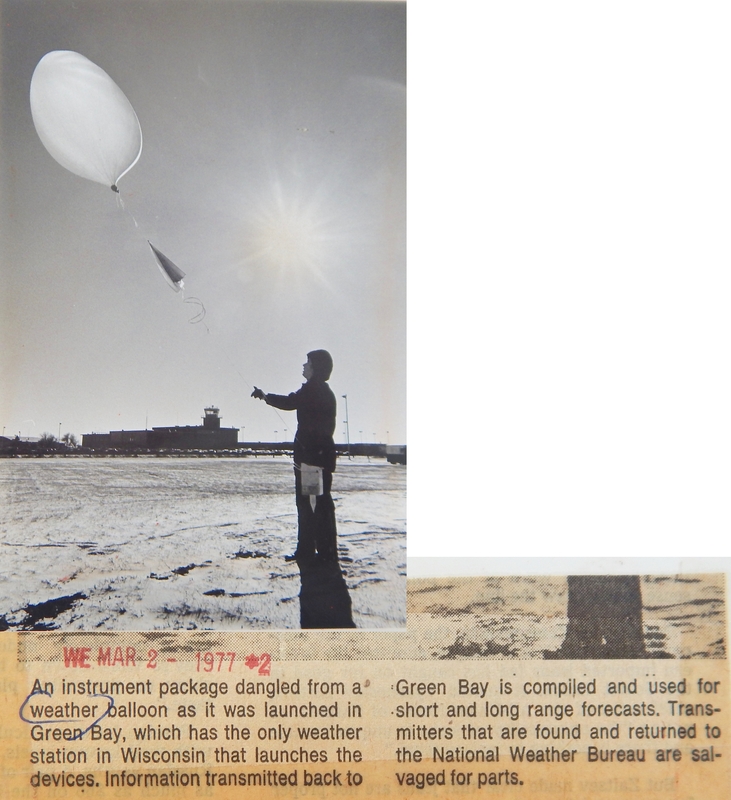 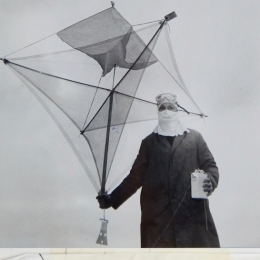 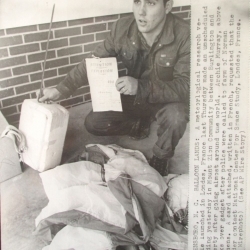 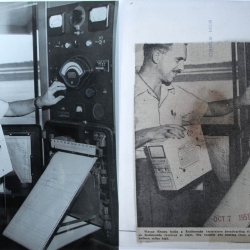 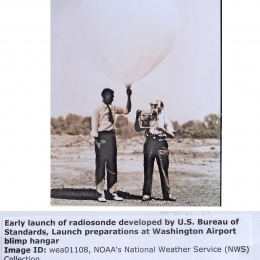 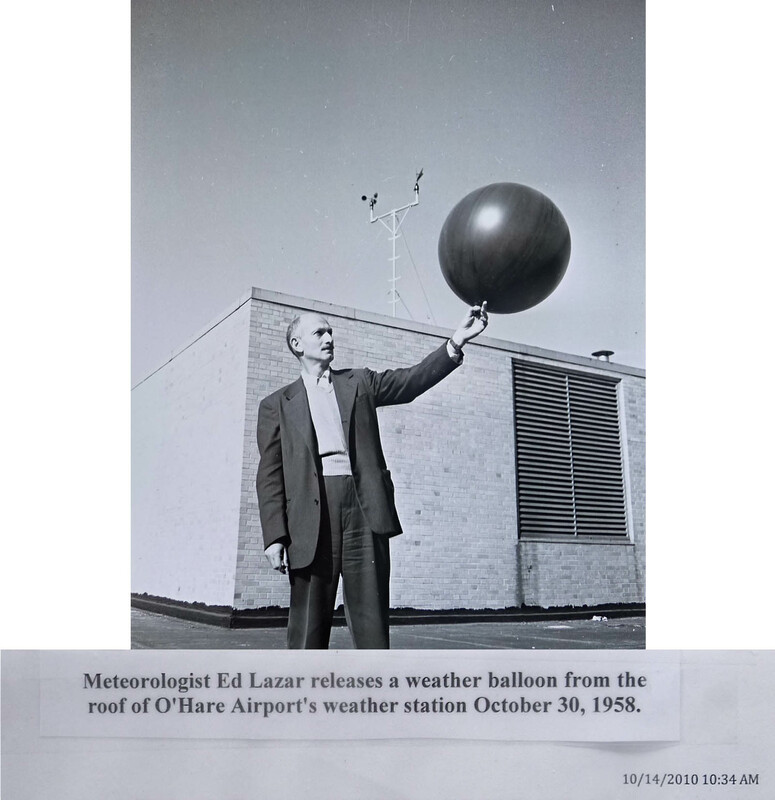 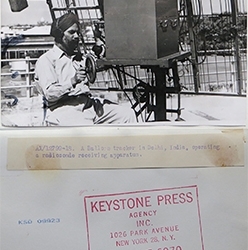 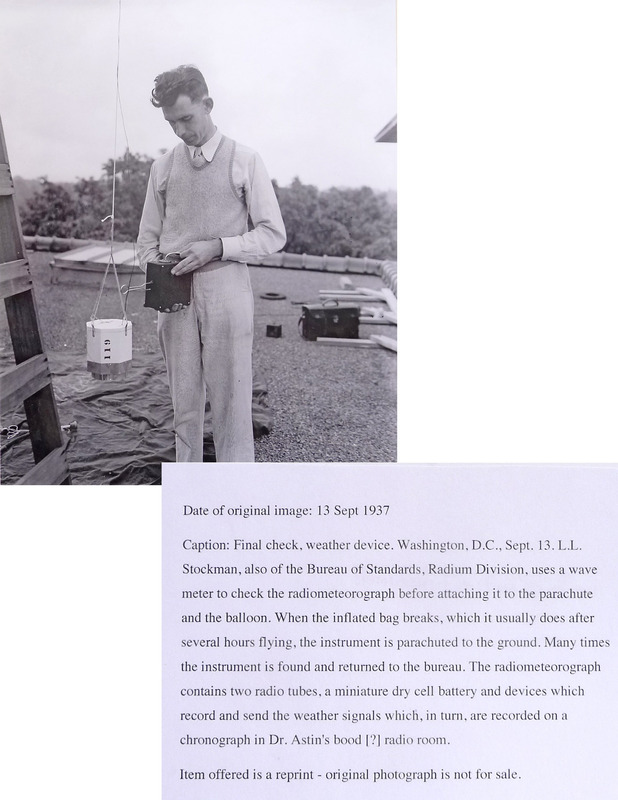 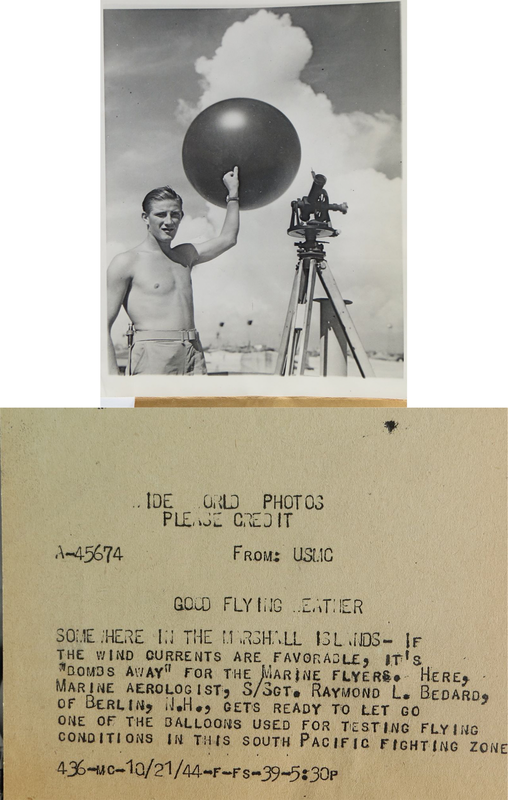 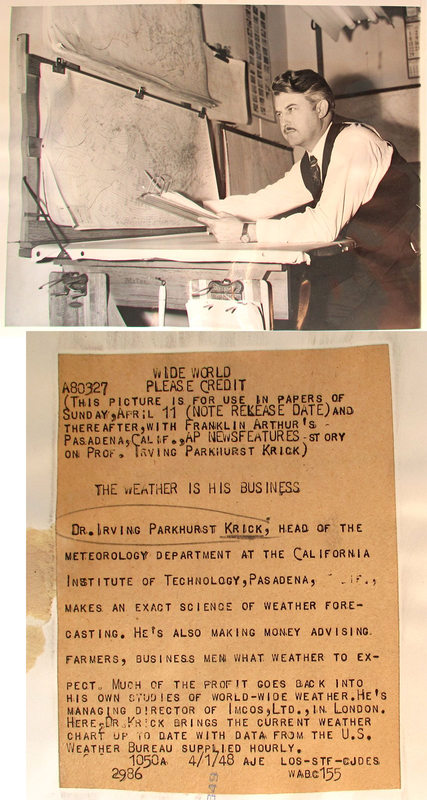 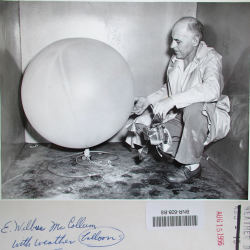 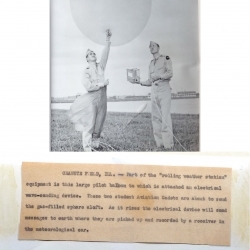 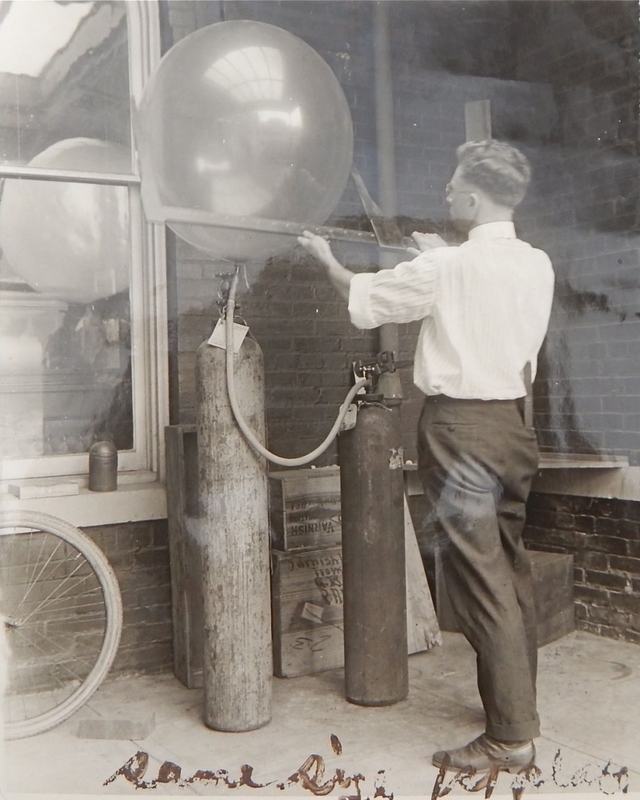 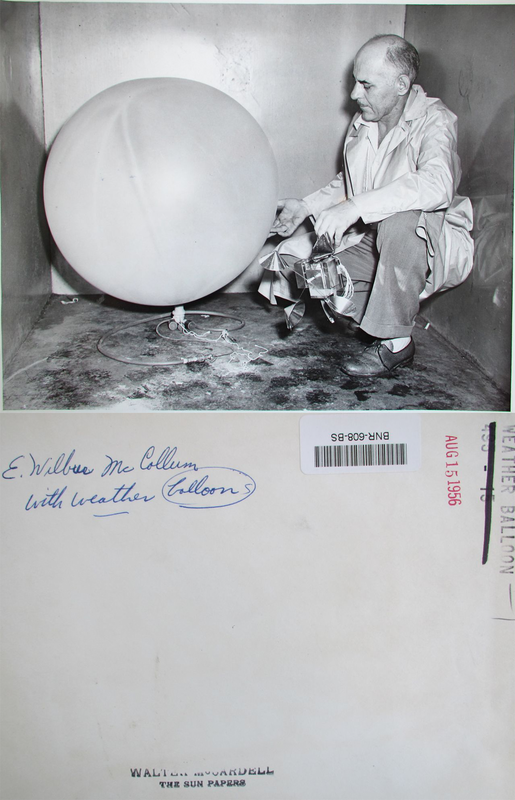 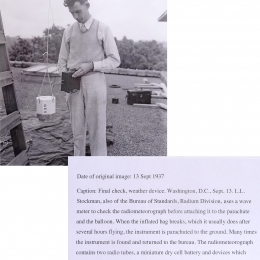 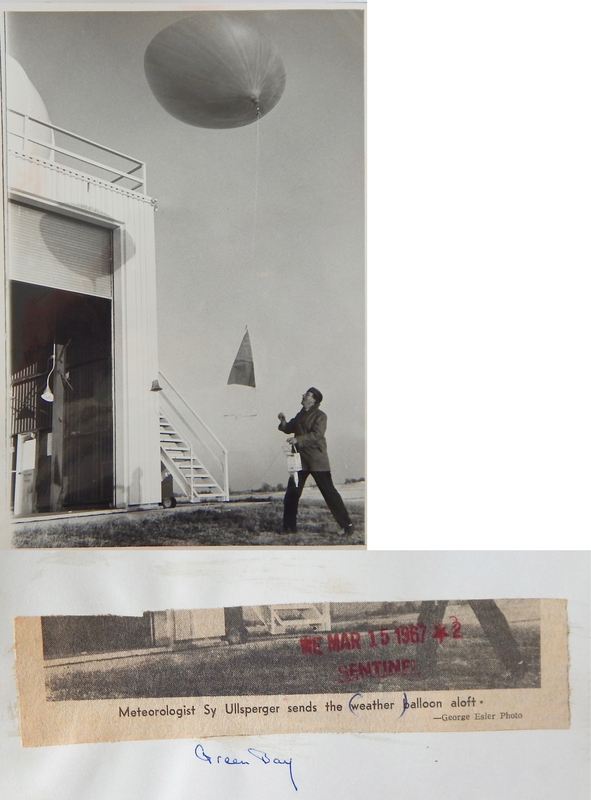 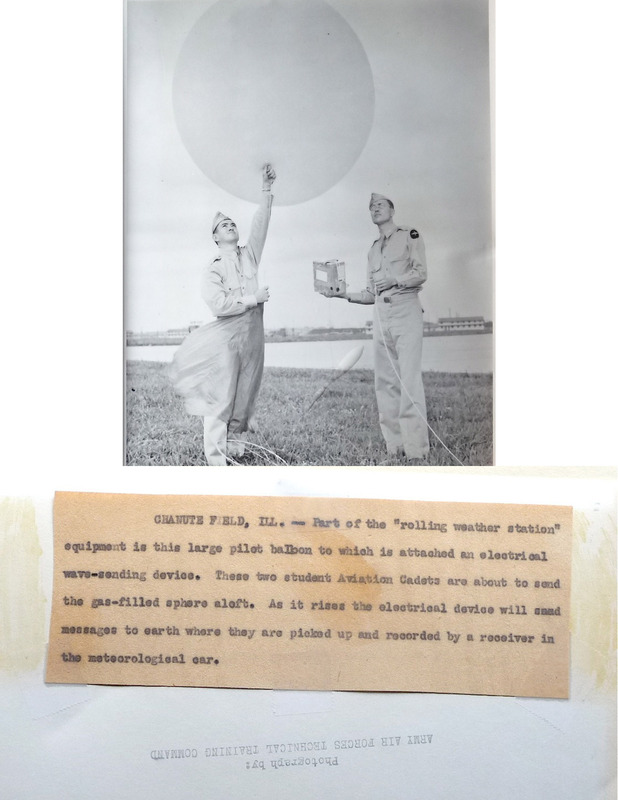 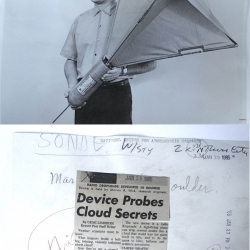 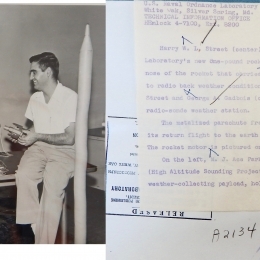 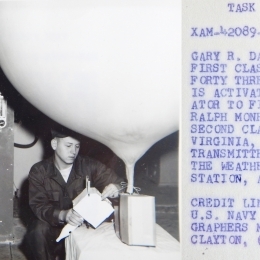 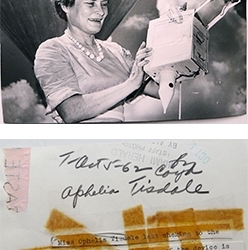 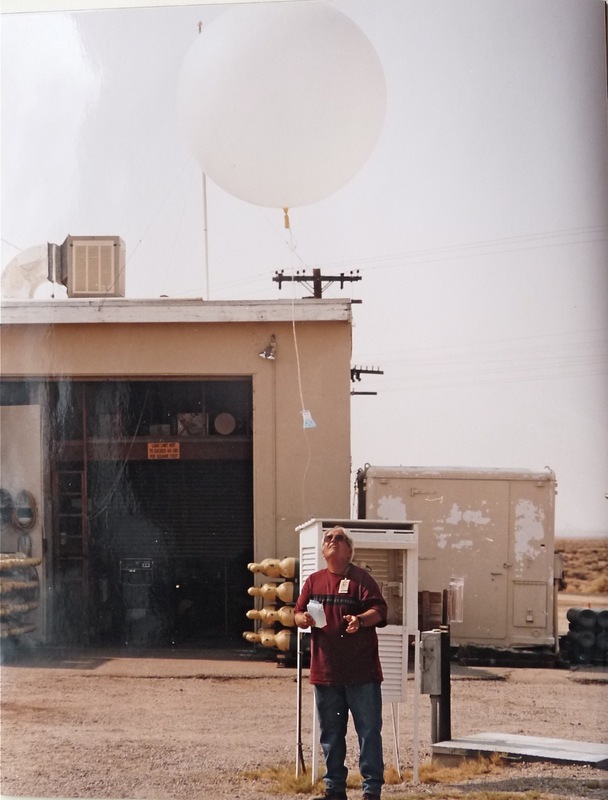 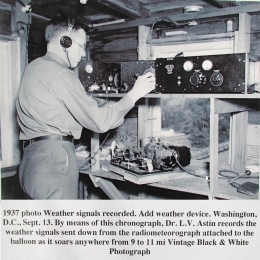 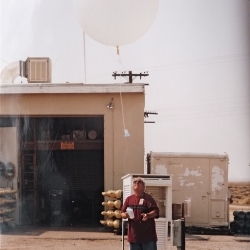 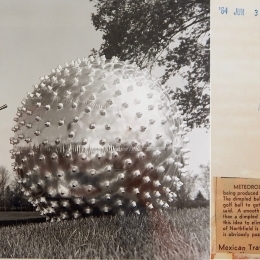 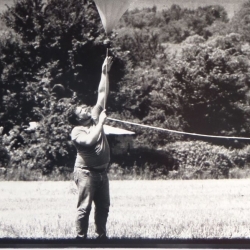 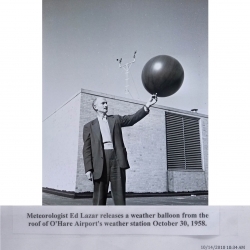 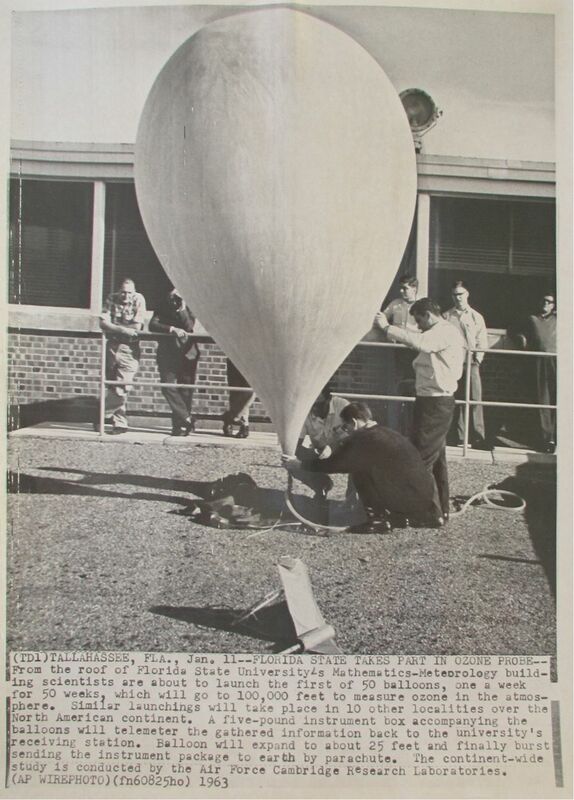 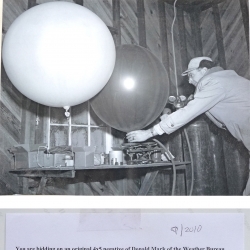 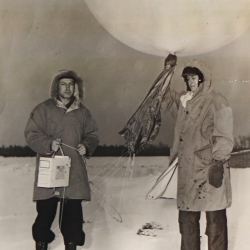 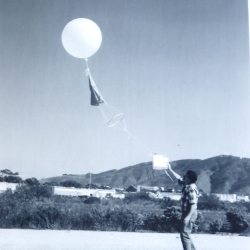 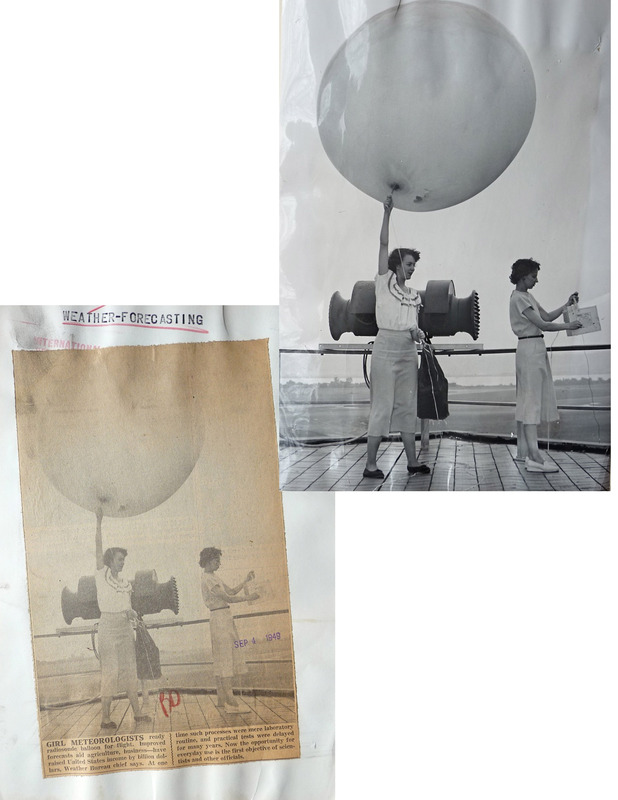 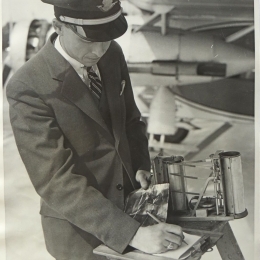 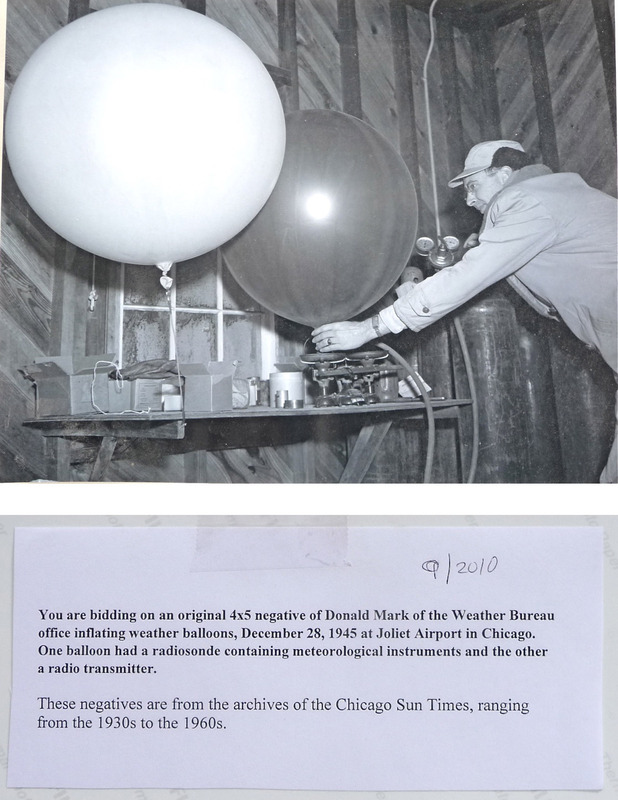 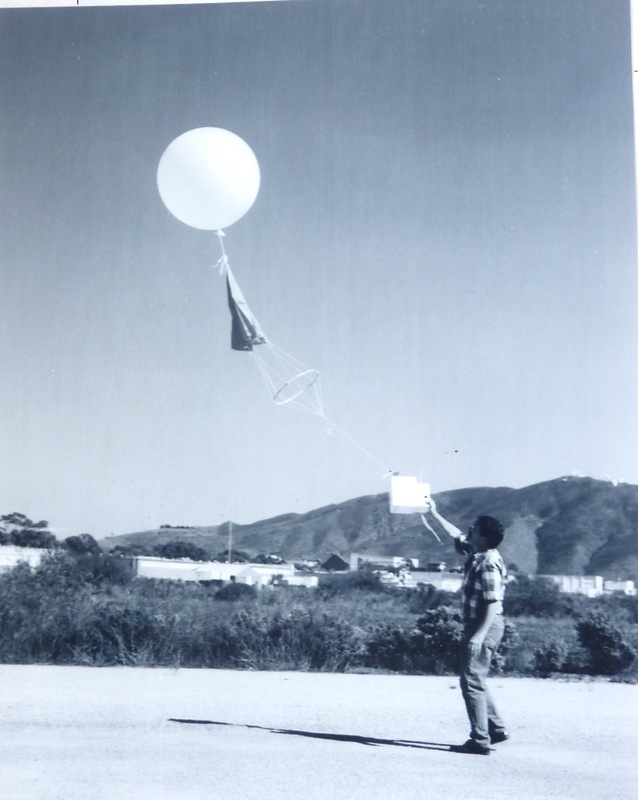 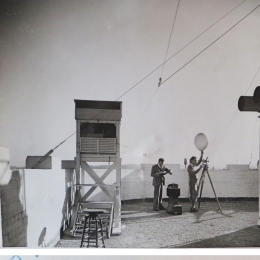 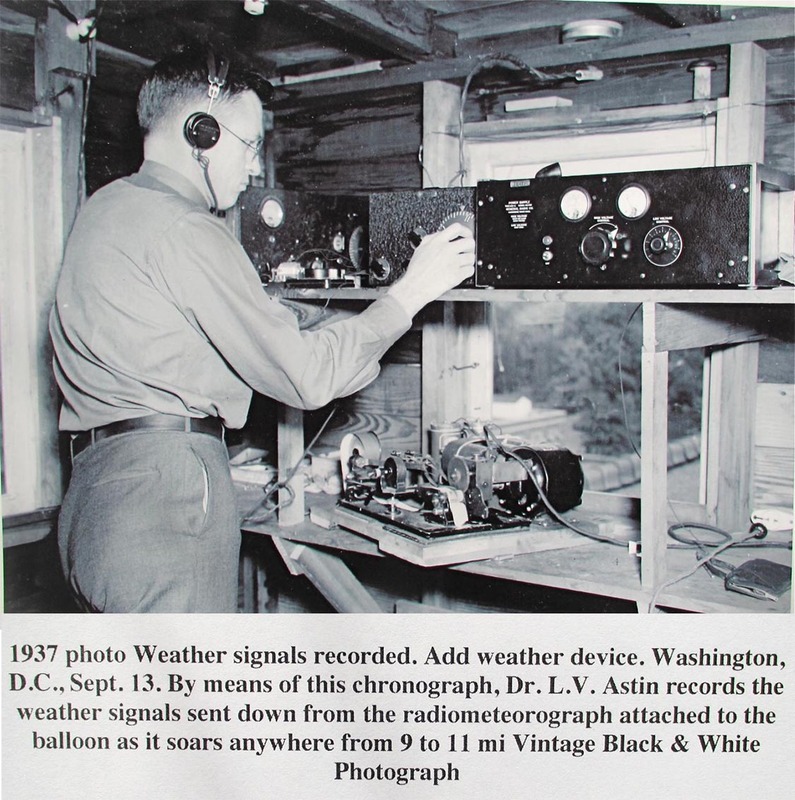 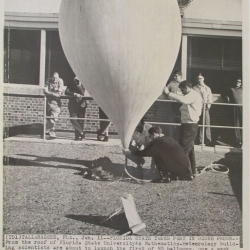 1950 circa--Howard T. Orville with Radiosonde.